The silence from this end is due to the fact that we have been in Auckland for the past week as our niece Sarah got married last Saturday. And what with the wedding, catching up with family and friends and generally getting a few essential things done like seeing the Accountant and doing a little retail therapy, we have not been up to writing the blog. However, over the next few days we will get ourselves organised and catch up. Now we are back in Nelson, and in between getting unpacked and sorting ourselves out, we spent the day picking tomatoes, peppers, onions, eggplant, chillies, zucchinis et al ready for pickling and bottling over the next day or two. Gotta love this time of the year. Day spent in and around Richmond, slowly working our way through the very long shopping and to-do list we had prepared. 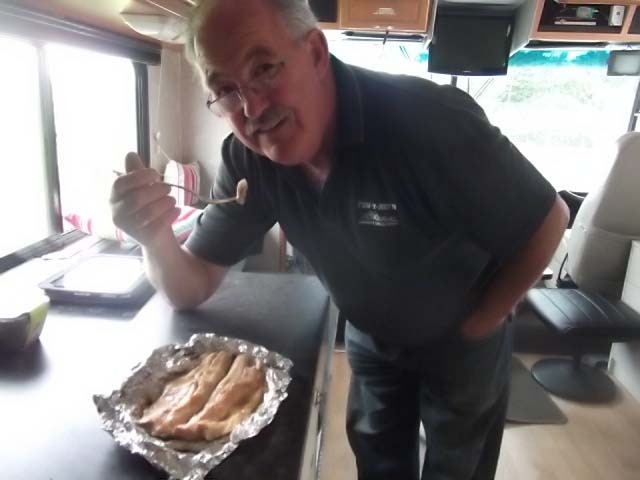 Another score today, being Motorhome Assn members we get a discount at Noel Leeming Stores. We had headed in there to buy ourselves an Indoor/Outdoor Temperature Gauge which of course required batteries. We bought some rechargeable batteries and instead of $30 a pack, with the discount they came down to $14! Score again. Happy St Patricks Day! 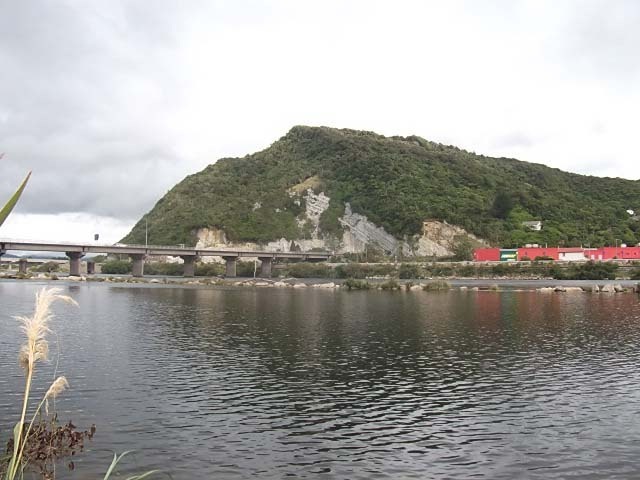 Off to the famous Nelson Market this morning, and what a treat, rows and rows of stalls all selling lovely fresh produce. I had to restrain myself as I knew we only had a few more days until we are away so we did not need a lot. After wandering around the market for the morning, we met up with friends Kevin & Fay. More friends from early days in Tokoroa and Putaruru. 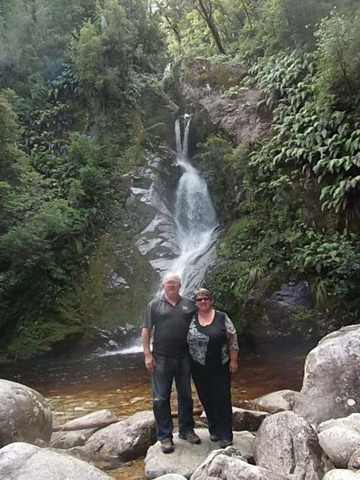 Kevin’s parents, George & June live with them in a lovely house in Nelson. Now this is where more coincidences occur, whilst they were giving us a tour of their house, it all seemed somewhat familiar. And sure enough, it turns out they purchased it from Chris, an Altrusa acquaintance. Small world. 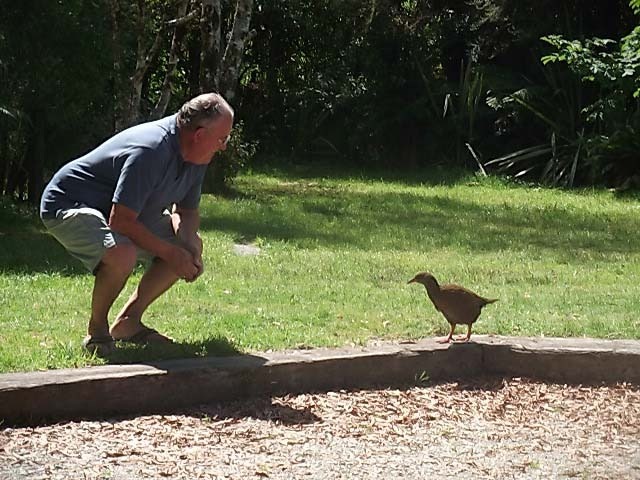 We spent the afternoon with Kevin & Fay, catching up on each others news. Anniversary Day for Mike, 40 years married. We miss you Ann. 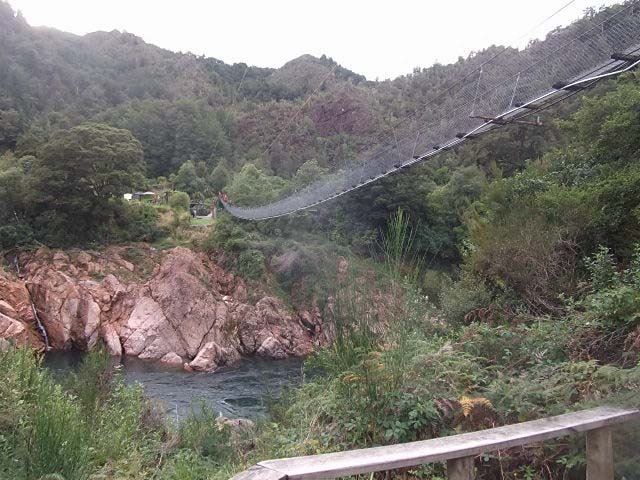 Spent in and around Richmond and Nelson getting ourselves organised ready to head to Auckland on Wednesday. Kevin & Faye along with George & June came to our van for dinner. A lovely evening was spent with them all. Fellow motor homer Ian dropped us off at the airport this morning to catch our flight to Auckland for niece Sarah’s wedding this coming weekend. Also catching up with friends, family and mates in the big smoke, will report in later! 30 years! Yes, its our 30th wedding anniversary. 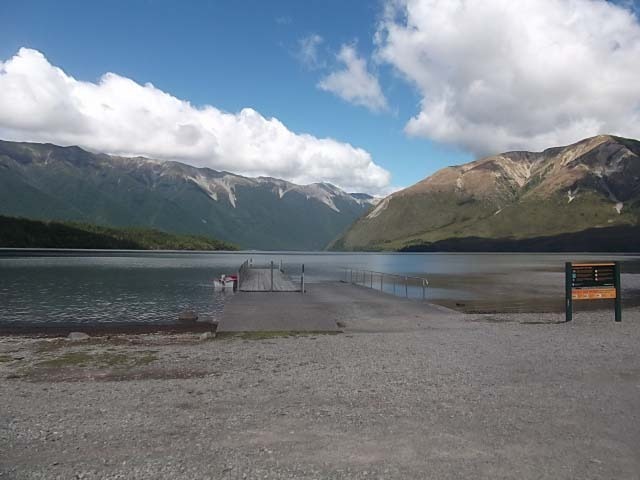 Wow, I really was a child bride :) In celebration we went off for a drive to see friends Pat & Sue who are currently Camp Mother and Camp Leader at DOC’s Lake Rotoiti campsite. We arrived at their camp set up, and after a quick look around settled down for talk and a cuppa, inside, away from the damn ever present sandflies! 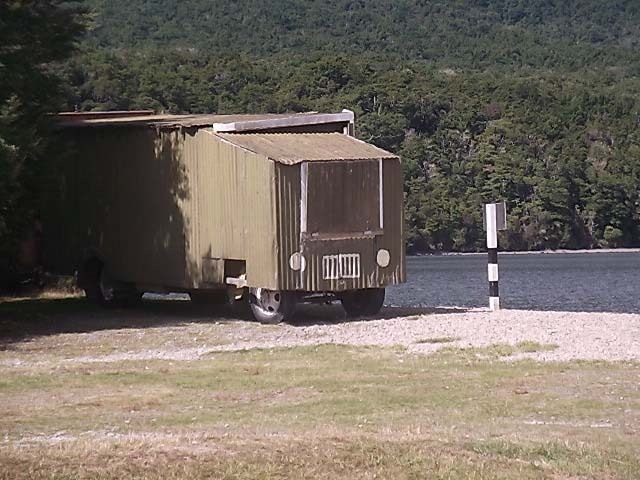 Whilst chatting, we happened to mention that it was not until we arrived at their camp site that we noticed that we had nearly run out of petrol Luckily for us, there is petrol available at St Arnaud, just 3kms down the road, so before lunch, Roy and I went off to fill up the tank and also to look around the other bays, camp sites and facilities. 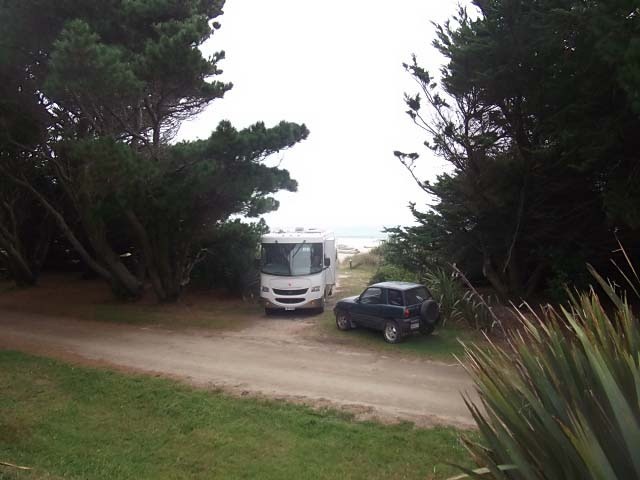 Great place to park a motorhome? Back for lunch where we cracked open a bottle of 1993 Hunters Miru Miru, a bubbly we had had in our cellar for sometime, and very nice it was too. We seemed to have only been chatting for a short time, when we realised that by now it was around 4pm so time we bade farewell and set off back to the Murchison POP. We arrived back at the POP to find Margaret and John there, fellow motorhomers we had got to know in Alexandra. We seem to be doing this, meeting up with the same people at different spots along the way, and its nice to see familiar faces at Happy Hour. Today was chill out day and chore day, housework done, laundry attended to with the rest of the day spent attending to lots of little tasks, interspersed with reading a few more pages of our books. 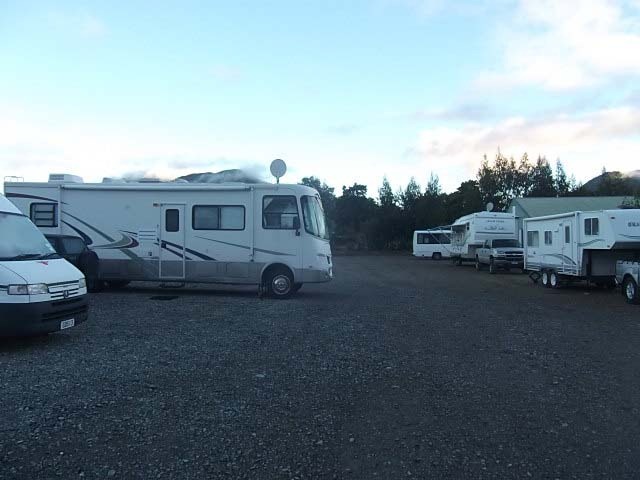 Time to move on out of Murchison and on to Nelson, as we fly out of Nelson next Wednesday to Auckland for a week. 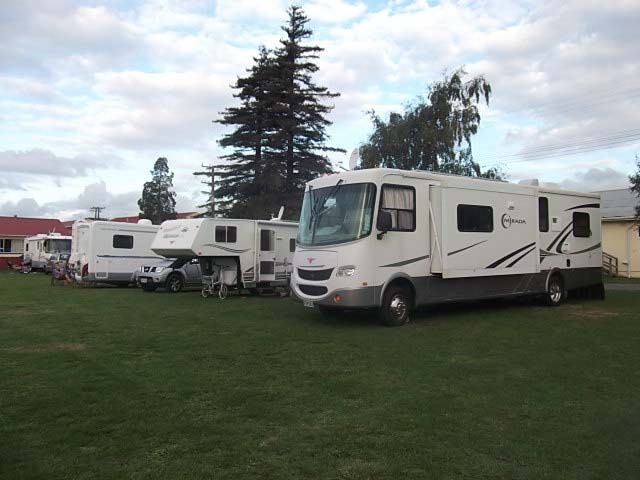 An uneventful drive, we arrived at the Richmond A&P Showgrounds/Racecourse where we are to stay until we leave, plus they allow us to leave the van here for a very nominal fee – $10 for the week! Score. After setting ourselves up, we unhitched the RAV4 and headed off down the road to Stoke to the VINZ centre to book the van in for its COF (Certificate of Fitness). We were met with the most hospitable of receptionists, told to go and pick up the van as they could do it right now. So back to pack ourselves up, and back off to the VINZ centre with fingers crossed, as we had heard from many other people of their experiences (all bad! ), and how expensive it was with costs ranging from $120 through to $163. The van sailed through the COF, phew, and that will be $98 thank you very much, which included a discount for NZMCA members! Another score. Off to buy a Lotto ticket! 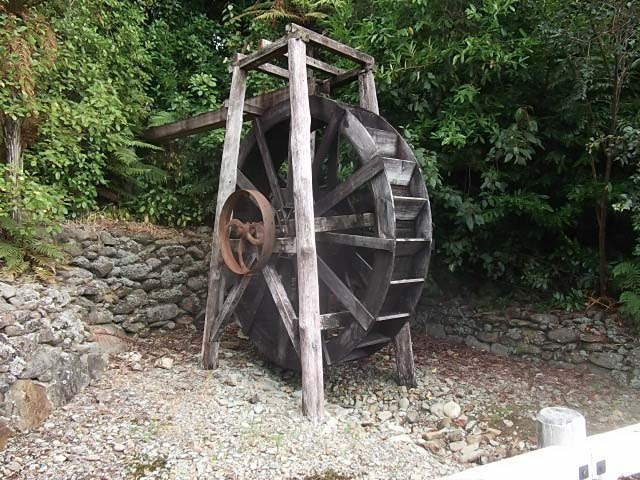 We will be here in Nelson and the region for the next few weeks exploring as much as we can. 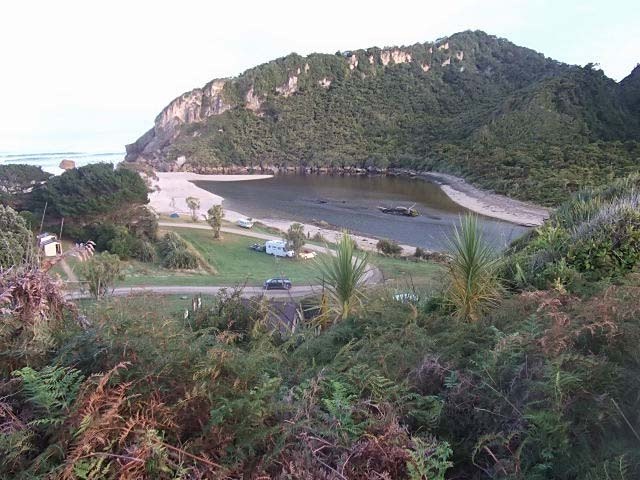 We are completely amazed at the number of people who are either camping here, day trippers, or starting/finishing the Heaphy Track. Watching the sun set last night we were surprised at the number of people on the beach, in fact the greatest number of people we have seen on a West Coast Beach since we have been over here. 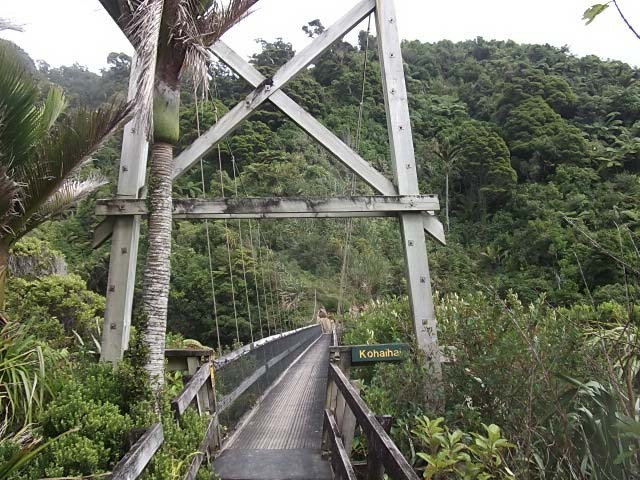 Roy was up and off early this morning to walk the zig-zag track overlooking Kohaihai. As it was a steep climb (and descent) the team member with the dodgy knees caught up on some zzzz’s. 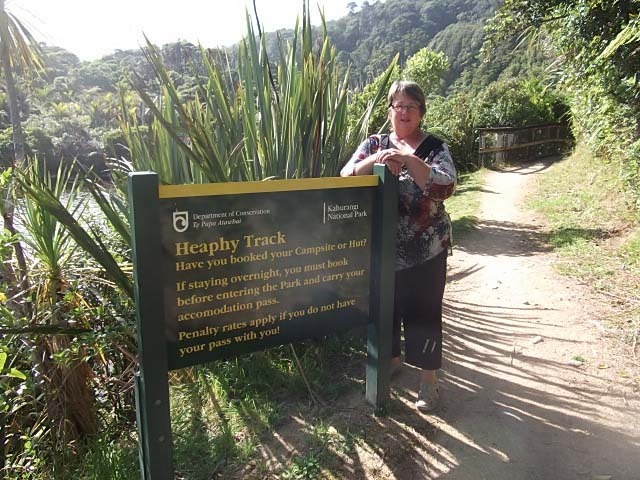 After breakfast, we both headed off to walk the Nikau Walk at the start of the Heaphy track. The Kohaihai river another tannin stained river on the coast. 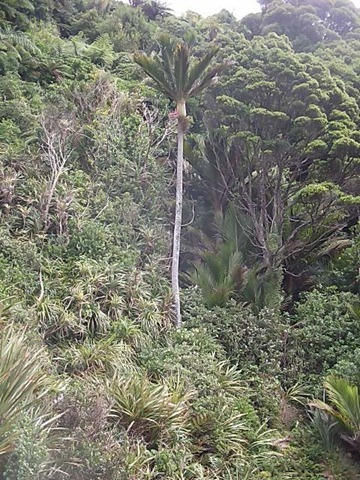 This was mainly on flat ground and consisted of a lovely walk through a forest of Nikau’s. 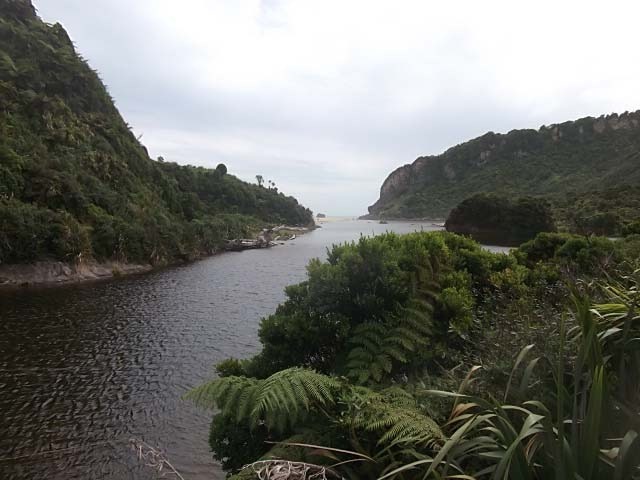 Once we had completed that loop, we made our way further along the track to the Scott’s Beach Lookout, this time up over a gentle gradient to afford us a great views across the estuary and to our parking spot. Back to the van, and time to put another loaf of our fantastic sourdough into the oven. This time a rye sourdough for a bit of a change. 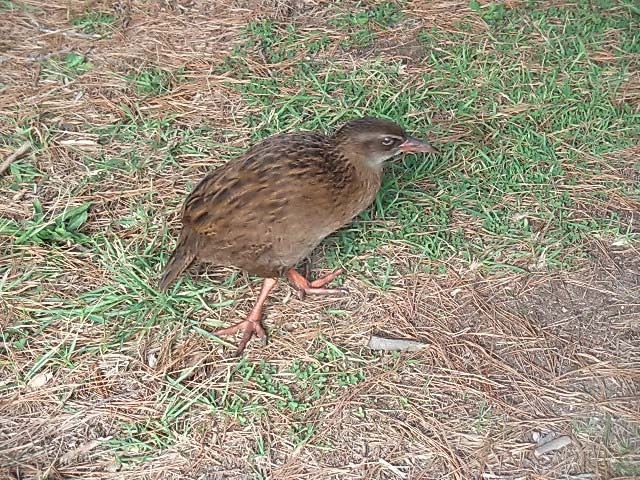 Willy the Wonky Weka with forward and reverse legs!! Poor fellow had obviously been hurt and his leg has healed incorrectly. But he is still able to run and is obviously well fed. Roy headed off to the surf for a bit of fishing however he returned shortly after not having had a bite, although he was bitten – damn sandflies! 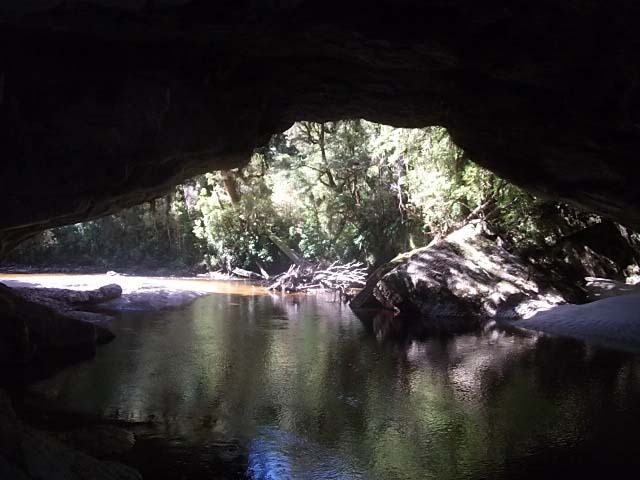 Packed ourselves picnic lunch as today we were off to the Oparara Caves. 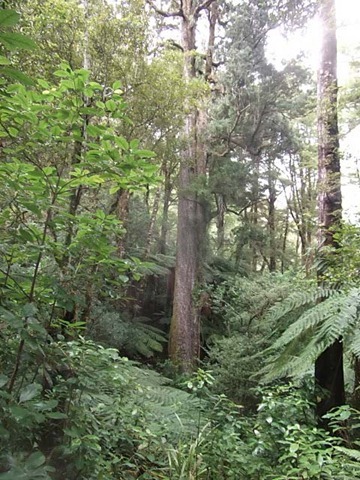 These are 16km inland from the main road halfway between Karamea and Kohaihai. 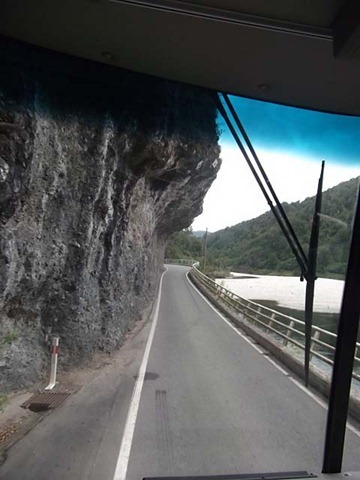 A very “exciting” road in, the male member of the party in the passenger seat of the RAV became quieter and quieter as the road twisted, turned, became narrower (affording him a great view over the edge… remember he does suffer from vertigo! 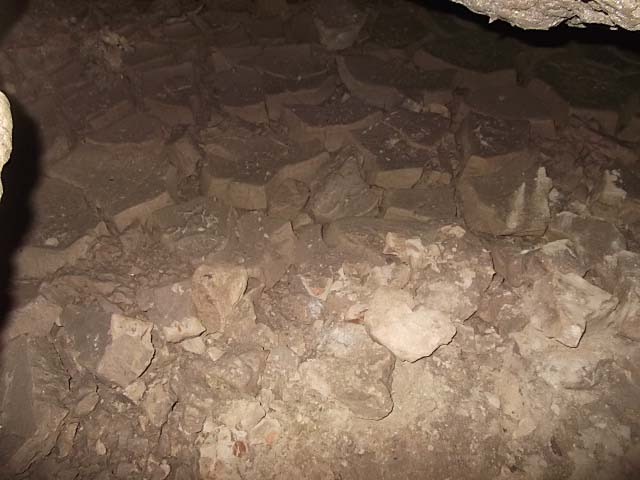 ), and became more corrugated and rutted with a few washouts and slips thrown in for good measure. 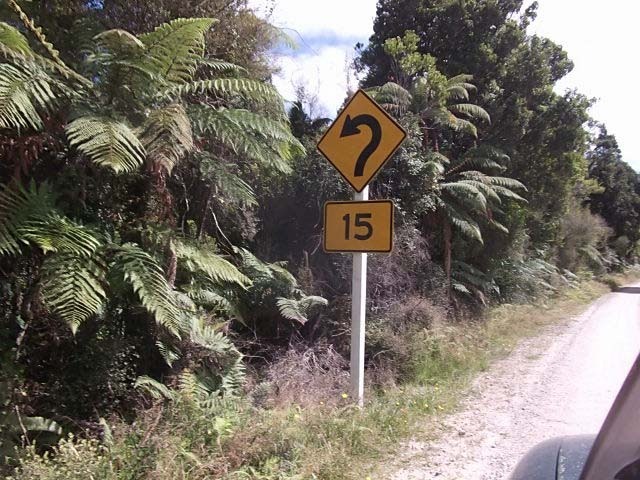 The 16km trip seemed to take an age, isn’t that always the way? as the return trip was over in a flash. 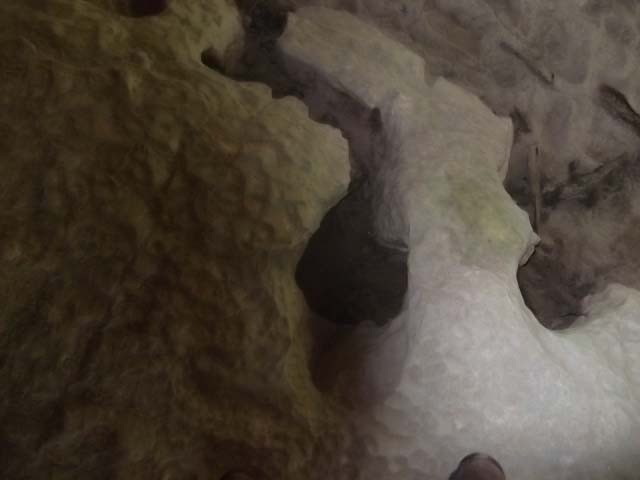 We headed to the furthest caves, the Box Caves and Crazy Paving Cave. 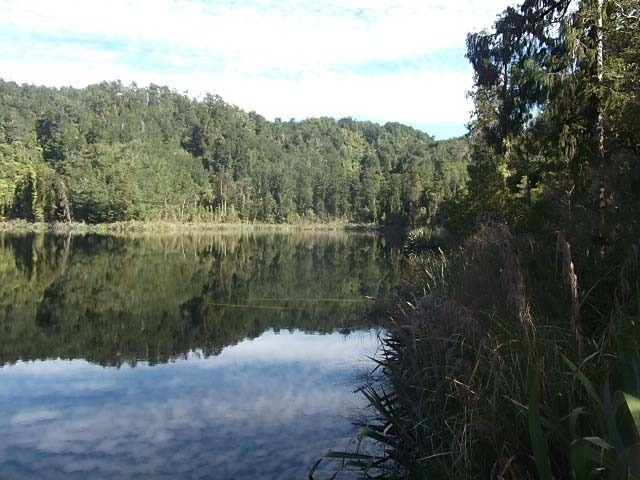 These are just a short walk from the carpark area. From there, we headed off to walk to the Mirror Tarn, we’ll let the picture say it all. 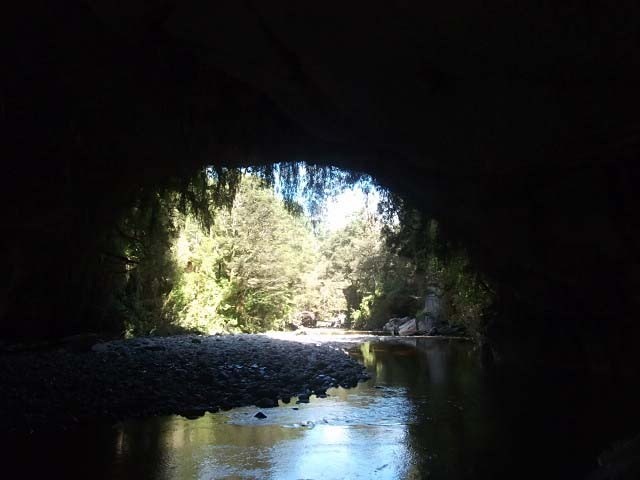 Then a short drive to the main carpark to view the Oparara Arch. 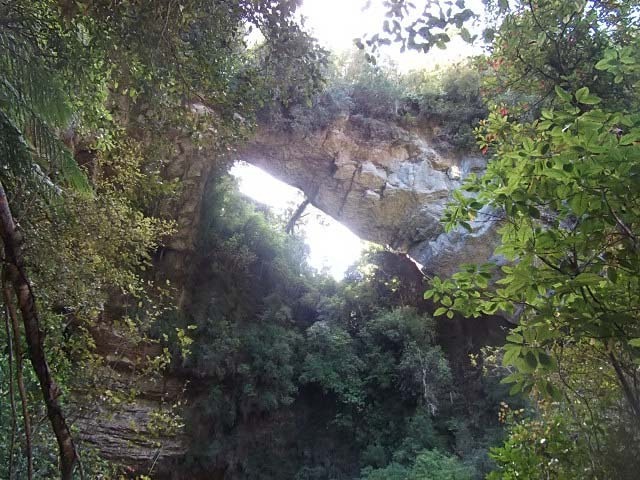 I thought this was the Aparara arch a limestone arch over the river approximately three metres wide. 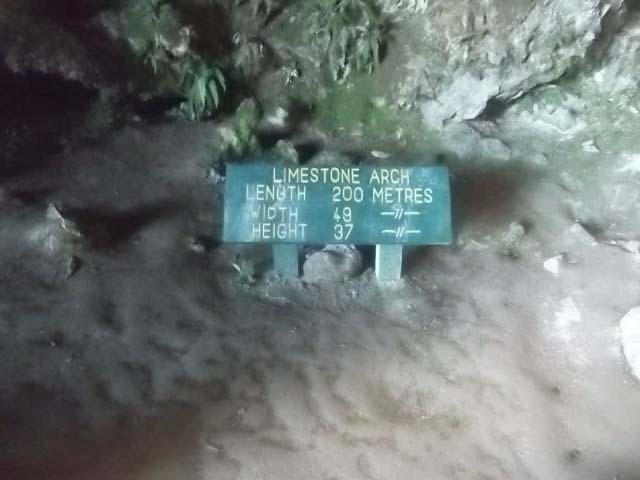 In fact these are the dimensions of the arch. 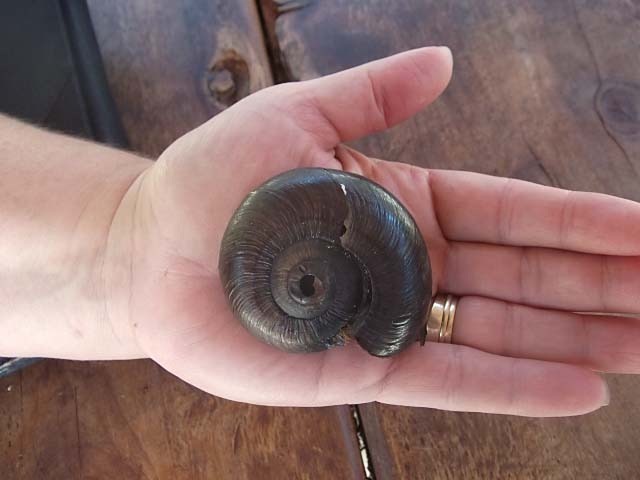 Found this empty shell of a Powelliphanta in the bed of the river. 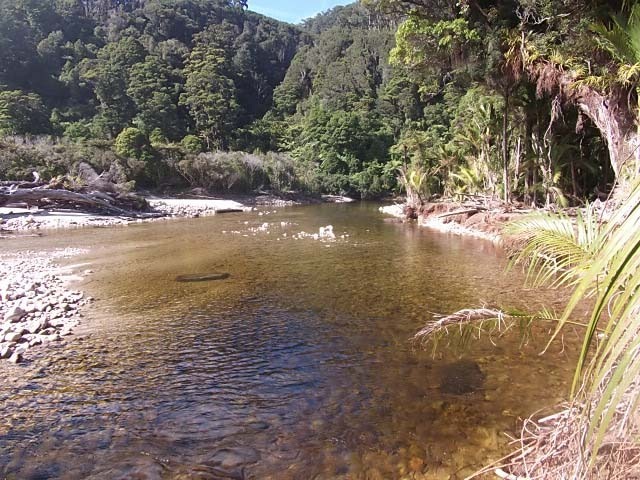 The quick drive out and off into Karamea in the hope of getting some cell phone reception and some internet. No luck with the phones but we could get some wifi at the Last Resort. Enough time to have a coffee, check emails, and upload the last blog entry before heading back to the van for dinner. 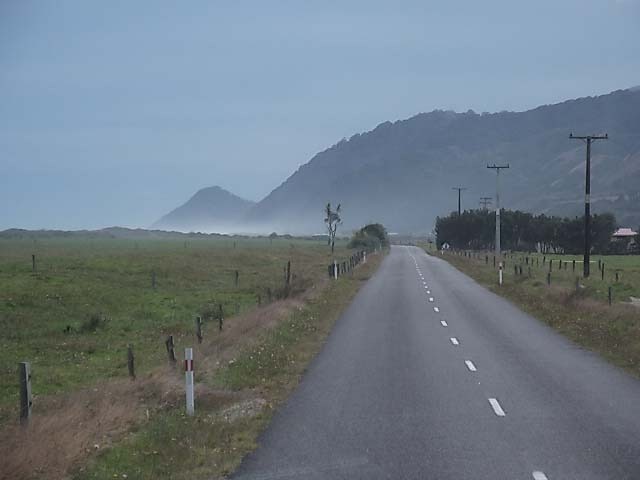 Left Kohaihai and headed south through Karamea and up over the hill. Why is it that the return journey seemed to take half as long and was not so hilly or windy?? We ended up at Sedonville, a VERY small settlement inland where we had great parking at the pub, and what is more, access to a washing machine. Laundry done and put onto the line, then into the pub for a drink and also to hook onto their free wifi! Oh and I think Roy may have just watched a little of the cricket on the tele!! Woke Sunday morning to steady rain falling, just as well all the washing was done the day before. 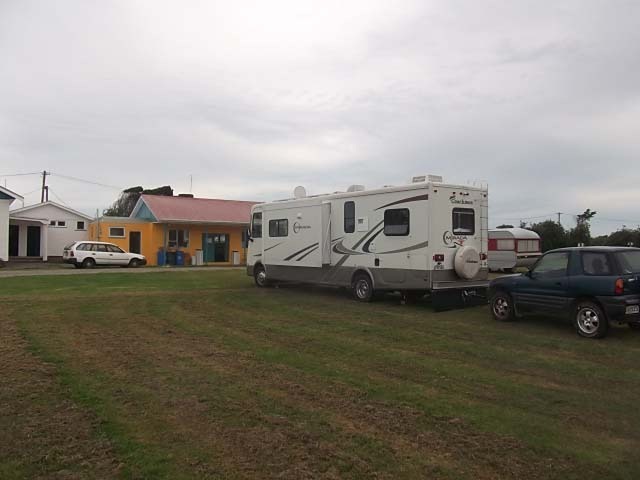 So we packed up and hit the road again, through to Westport where we were going to stay for a night but we decided to carry on to Murchison where we knew that the Motorhome Assn has a great parking facility complete with dump station and water. 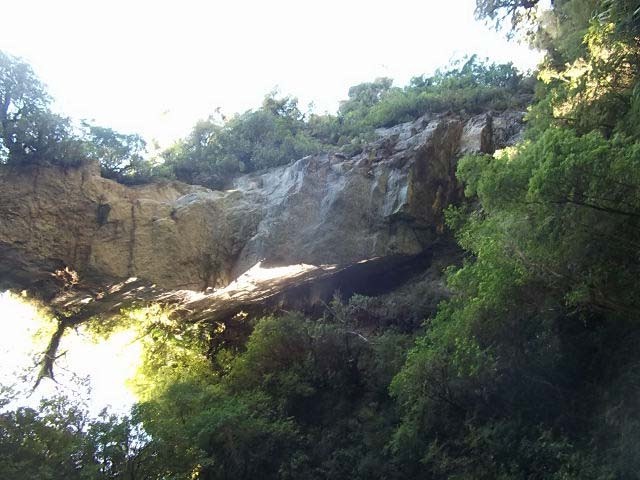 So back through the Buller Gorge and into Murchison. Now isn’t it funny the people that you meet on your travels. 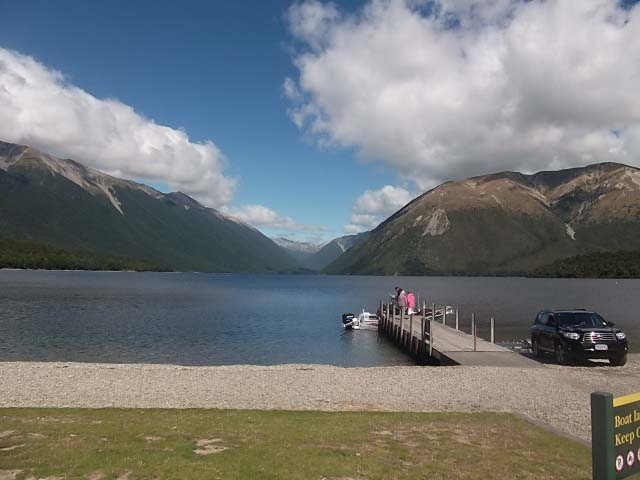 We met up with Margaret and Ray whom we had preciously met at Lake Dunstan. 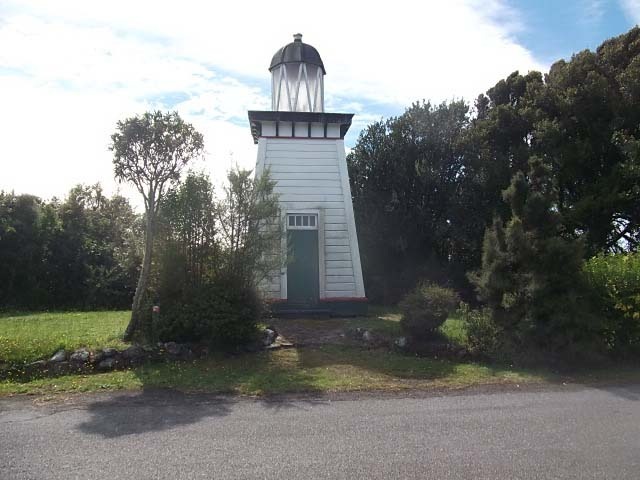 Turns out they were originally from Tokoroa and Margaret even used to live in Putaruru and own the dairy at the top of our street!! Margaret was married to Harry Sanson who was a Pool driver at Kinleith. Happy hour(s) ensued with many tales swapped – mutual friends and acquaintances must have had burning ears last night! 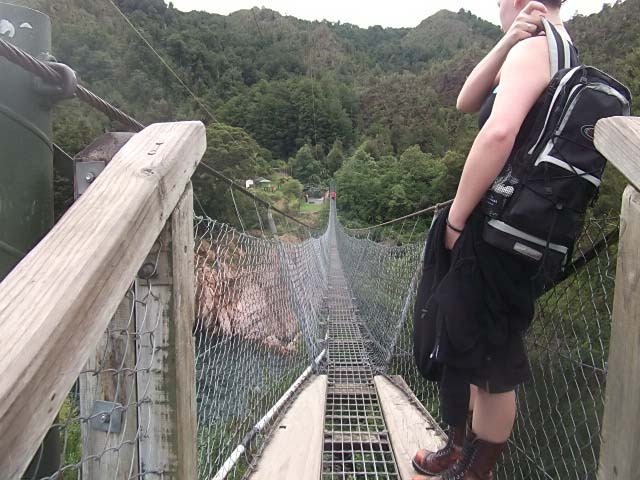 Off this morning back to the Buller Gorge to walk over the swing bridge (the longest in NZ) and yes, I was petrified (note this does not refer to Roy)!! 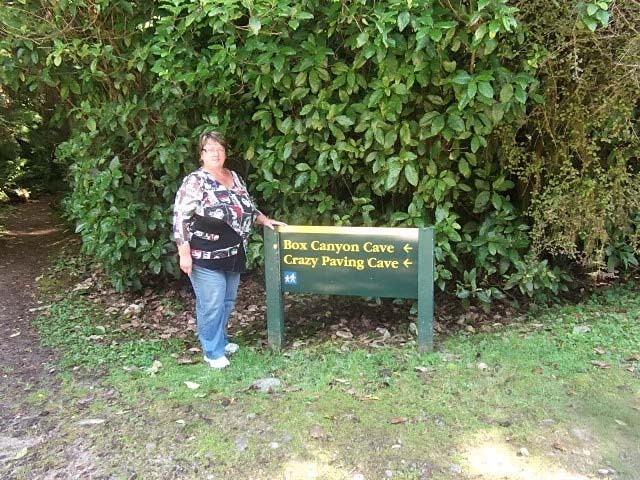 Then off for a bush walk to see some of the sights. Just shows how much the earth can move. 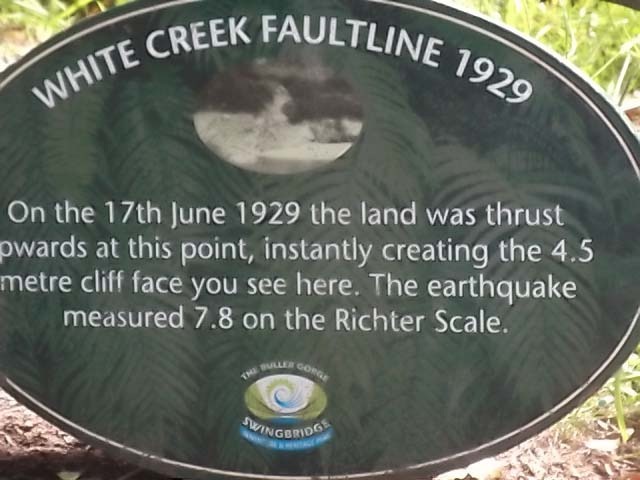 And not just in a small area, this fault was over a length measured in kilometres. 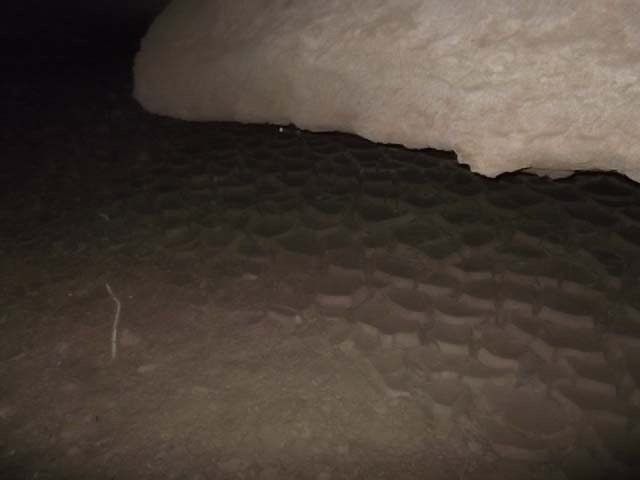 This is the normal level of the river. 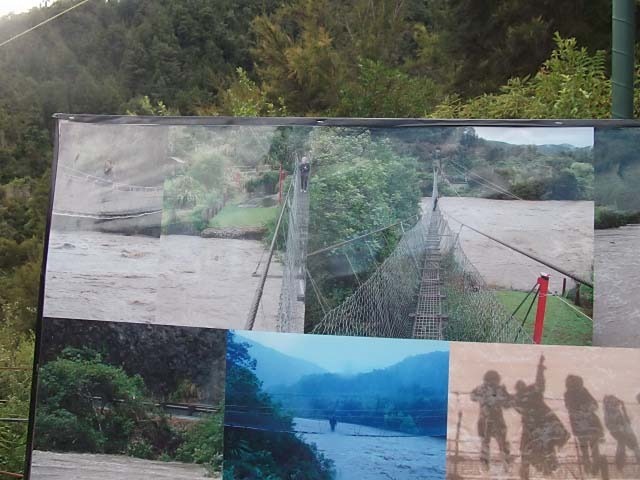 The pad to the left of the river is that shown in the photo only about two metres above water level in the flood photo. 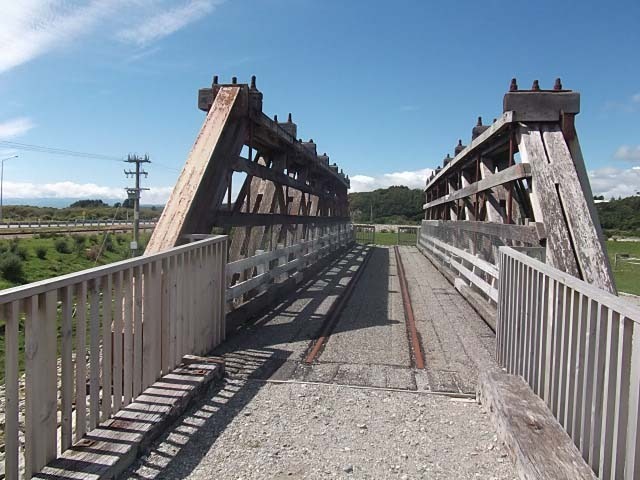 Bridge from the end opposite the main road. 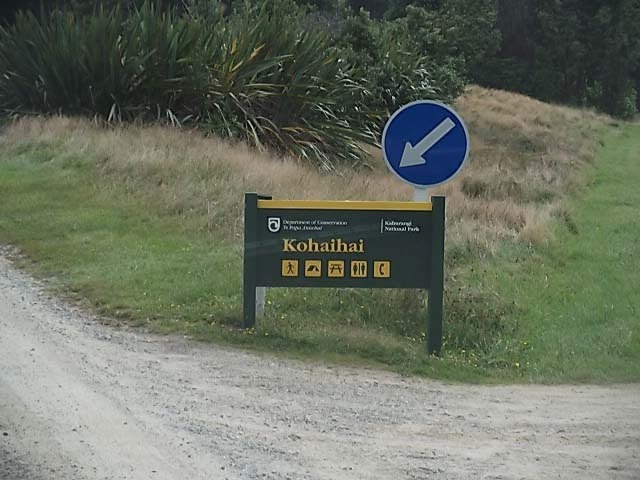 And again, funny who you meet, reading an interpretative signpost as Roy had gone off to do another walk, I was chatting to a fellow walker, and just happened to ask ‘Where are you from?’ the response was ‘Middle of the north island’. ‘Oh yes? Whereabouts?’ ‘Tokoroa’ was the reply! Sure enough someone else we knew from a few years ago, Keith Cotter and his wife Kay. 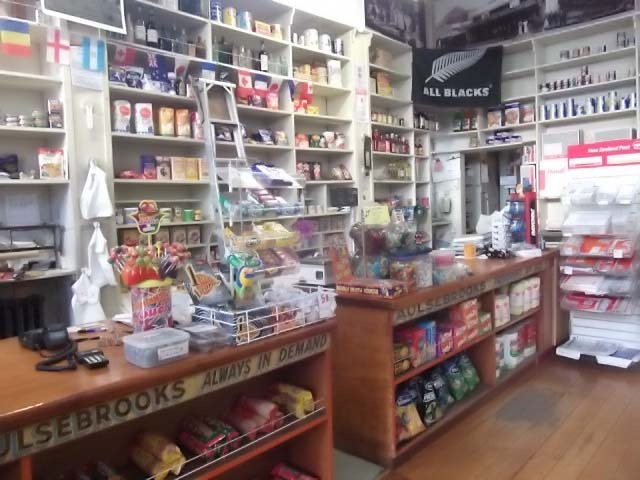 Turns out it really is a small world as Kay worked with Mum at some stage, and they also used to own the same dairy at the top of our street in Putaruru as Margaret from the previous night had also owned! We ended up chatting in the carpark for ages until the sandflies got the better of us all. They say that the journey is more important than the destination, and how true that is. We have never been ones to get from A to B in the quickest or shorted time, in fact we seem to go from A to B via Aa, Ab, Ac..you get the drift? 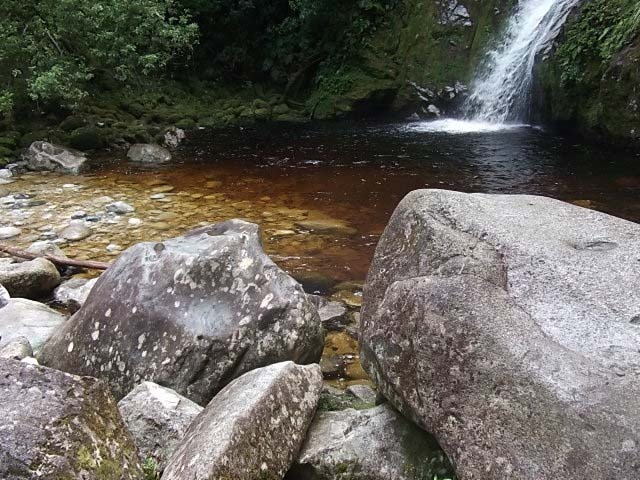 We try to meander our way along discovering the byways and all those wee places that most people go whizzing by. Even so, we have missed a number of places and they are now on our “next time” list with a promise to ourselves to take the time now and have less on that list. 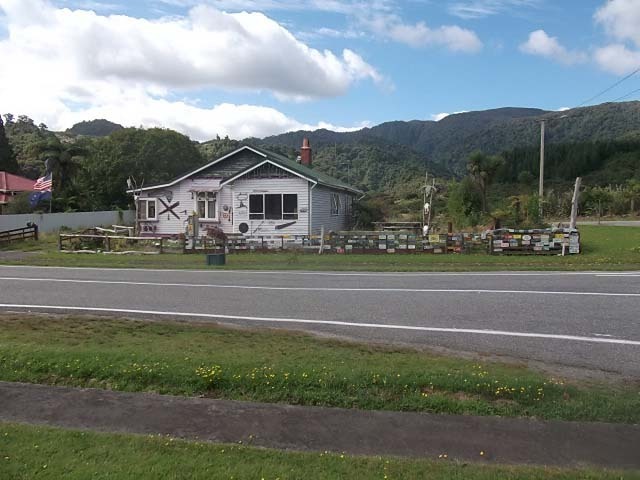 We left Slab Hut Creek on Tuesday morning(6 March), stopping off in Reefton to catch up on emails and phone calls before heading off toward Westport. 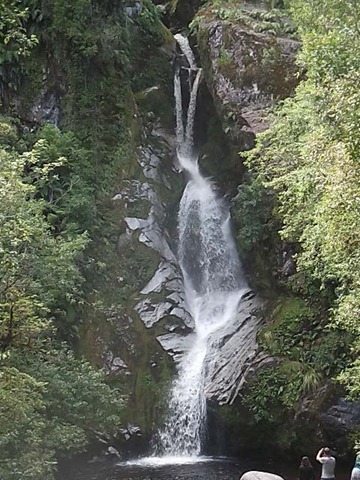 An uneventful but interesting drive through some lovely country, with the most spectacular through the Buller Gorge. 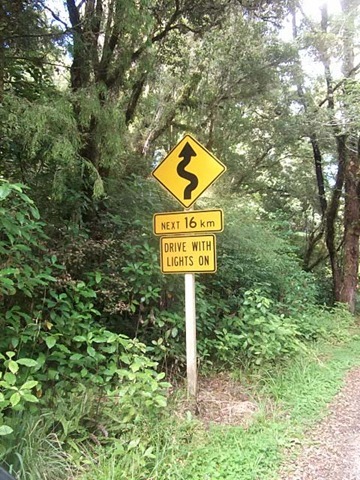 Whereas others just tell you to slow down, as if we weren’t already! 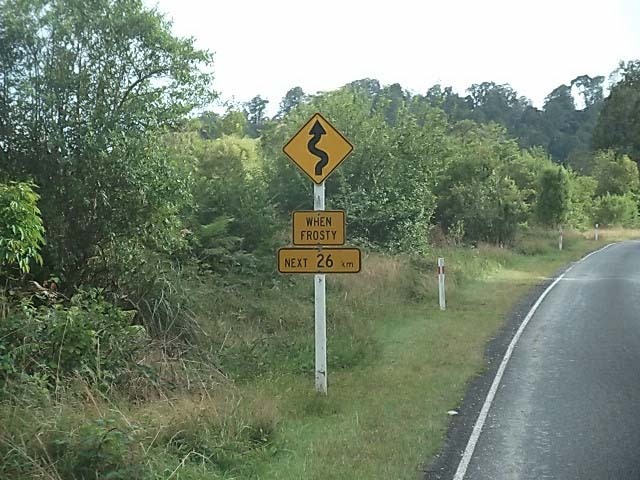 does this mean trucks are dancing around the corner? 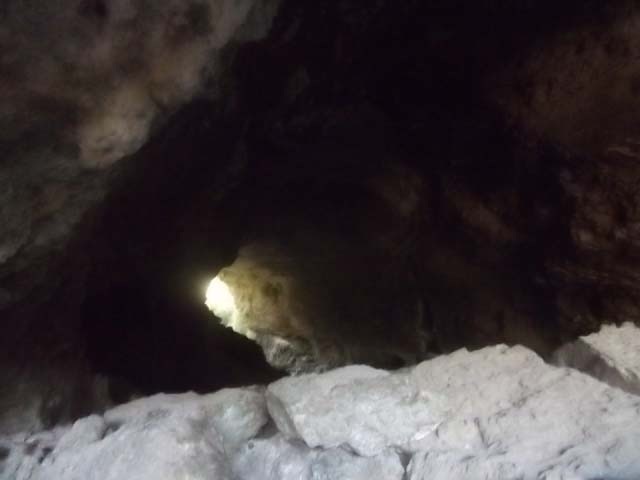 and sneaking through under the crag. 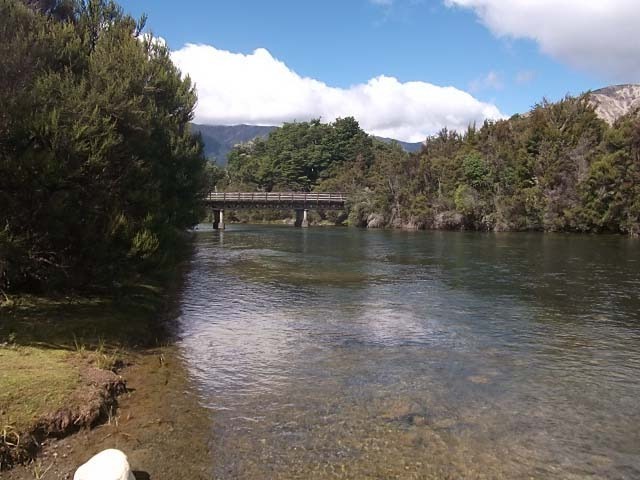 Westport was always going to be a brief stopping point in which we could fill up with petrol, empty the waste tanks, fill with fresh water and restock the pantry. 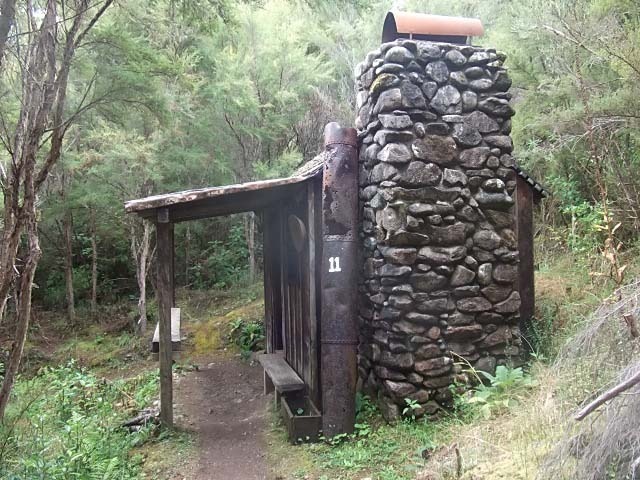 That done, we headed off toward a POP north of Stockton, however, we missed the turn off (GPS coordinates were wrong) so ended up continuing on to Mokihinui. Where, for the first time since last September, we went to a Camp ground. Well, it is called a camp ground, more like a large field with an ablution block and a few power points. We did not need power so parked up and proceeded to settle in. 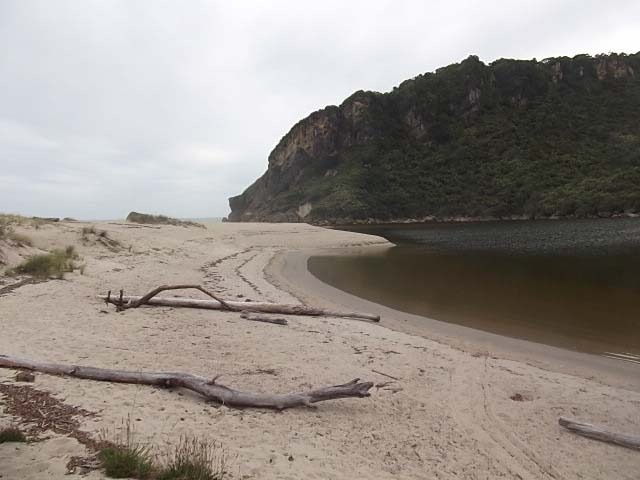 Roy hopped over the dunes to the river entrance to try for a Kahawai or Salmon (no luck). Wednesday morning and off to use the showers, it felt quite wicked to leave the water running the whole time we showered as we are so used to the ‘navy shower’ technique. However, it was rather nice and we wont knock it. We also took the opportunity to use the kitchen facilities to wash our dishes so less water going into the waste tanks. 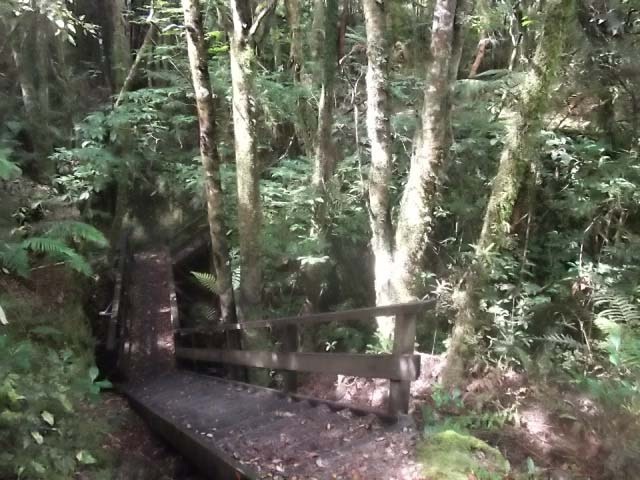 That all done, we headed off toward Karamea. 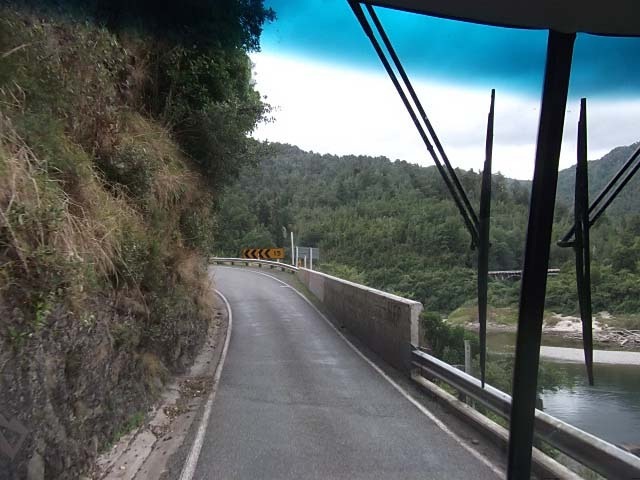 Now if any of you have driven over the hill to Karamea will know what the road is like, now imagine driving over it in a 10m bus towing a car and you will appreciate the skill required by the driver. 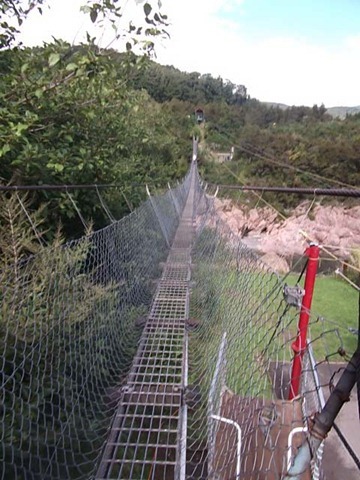 Some corners were a little tight and with the passenger looking down over the side of sheer drops, it is surprising clean underpants were not required by the journeys end! 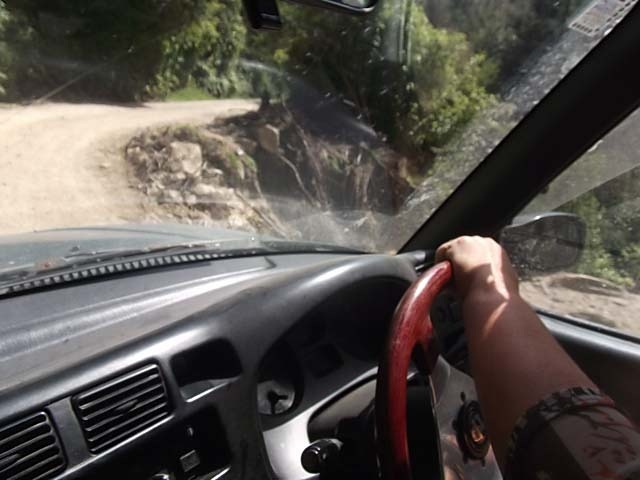 Meanwhile, the vertigo suffering driver kept his eyes glued to the road whilst taking deep breaths. 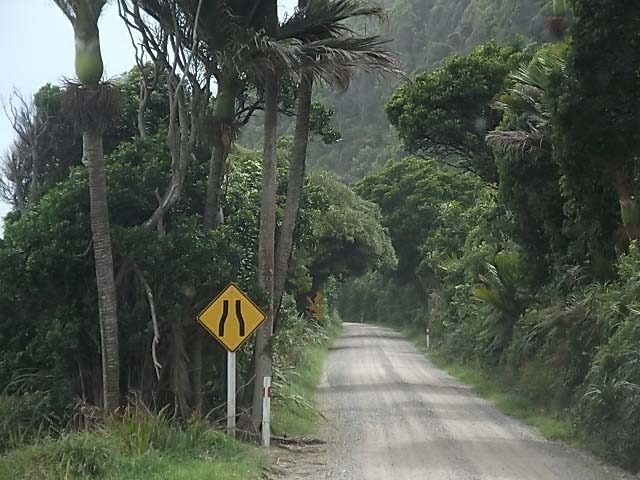 We took a tea break in Karamea before deciding to continue on to Kohaihai, the very end of the northern end of the West Coast road and the start/end of the Heaphy Track. That’s our destination up ahead in the sea mist. 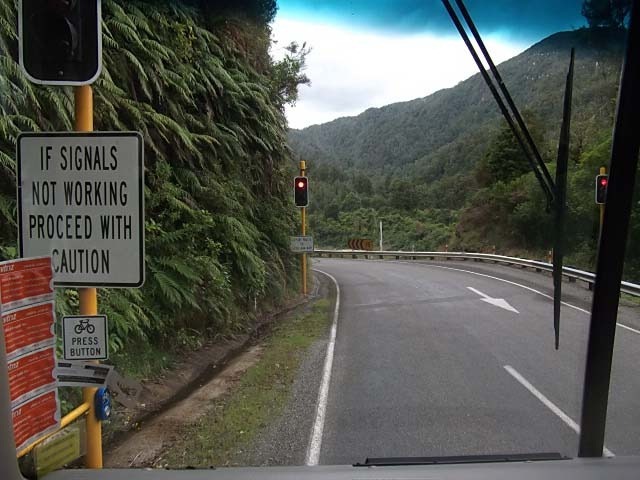 But first we need to go along this road which was already a one lane road, now its narrowing to what, a half lane road? 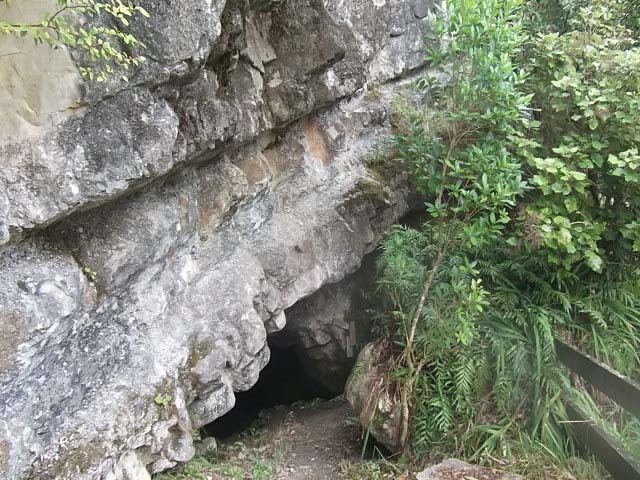 So here we are just a few metres from the sand and the ocean and will stay here a few days and explore the region, more specifically the Oparara Limestone Caves. Mind you, the sandflies here are large, voracious and in huge numbers so we will see how we go. and this fellow looking over the beach. 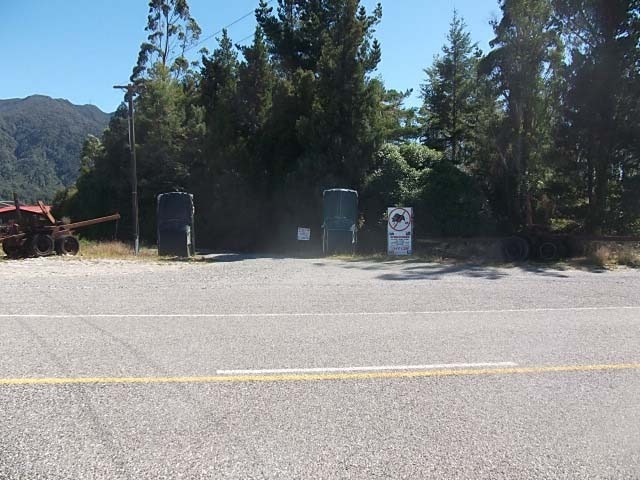 The plan was to leave the parking spot in Hokitika with Roy heading off in the van to fill up with petrol and water with Bernice to follow. Oops, someone left the lights on in the RAV so a quick phone call and Roy returned to jump start the car. Off this time! 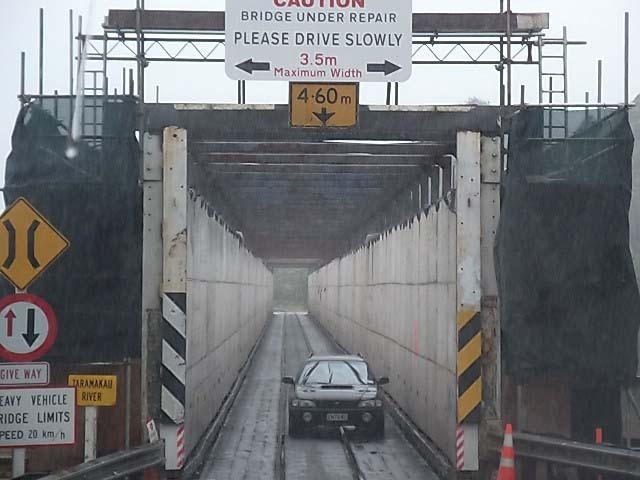 An uneventful drive through to Greymouth, apart from negotiating the Turamakau Rail/Road Bridge which was under repair…. Approaching…how wide are we again?? breathing in…..we squeezed through with just a whisker to spare on either side. 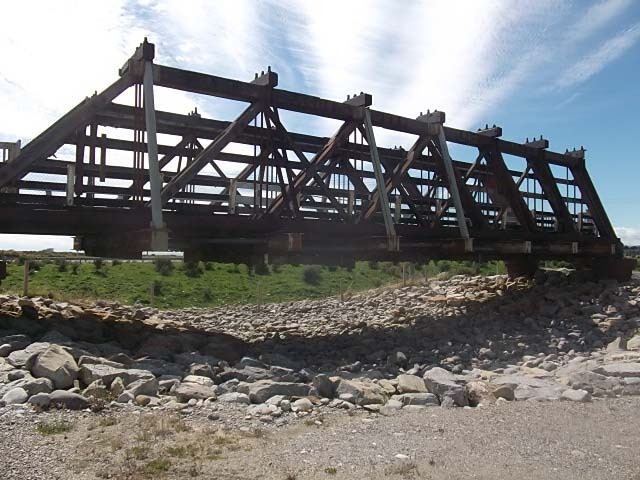 We headed straight to the Cobden Bridge to the dump station and then parked up. 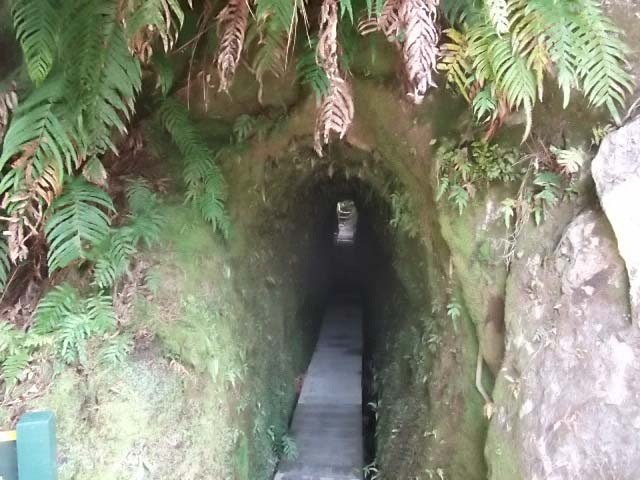 Something unusual along from the parking area and under the road from Greymouth to Westport. 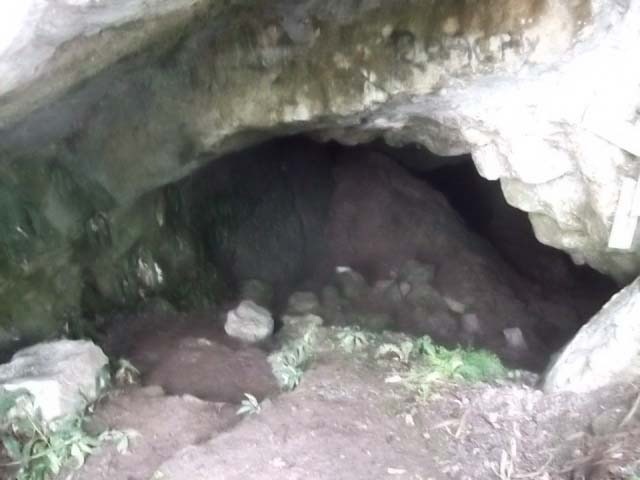 A deep cave going right under the main highway! 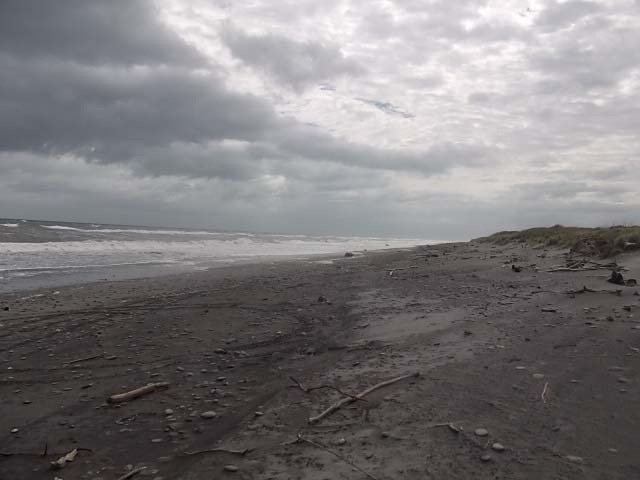 The weather in Greymouth was just that – grey, or gray! And the wind was pretty strong too. Never mind, we had things to do so this would do for a couple of nights. The weather did not improve at all, the wind became almost gale force so we hunkered down, attended to what we had to do including Bernice doing a bit of baking. As it was so windy, we did not want the satellite dish up for too long so after we caught up with the news, we watched a movie. Pat & Sue had given us a few movies to watch so the first night we watched The Boat that Rocked – hilarious with good music too! and the following night it was Gran Torino. I am sure that our neighbours must have thought we were mad as we really did laugh out loud throughout both movies. 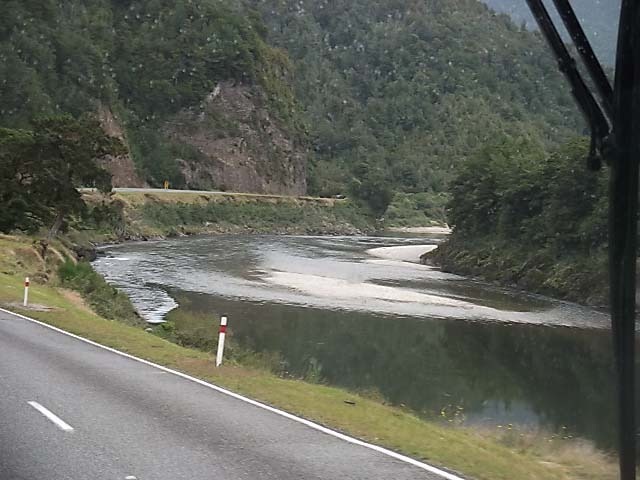 Enough of Greymouth, work done so we headed off inland toward Reefton. 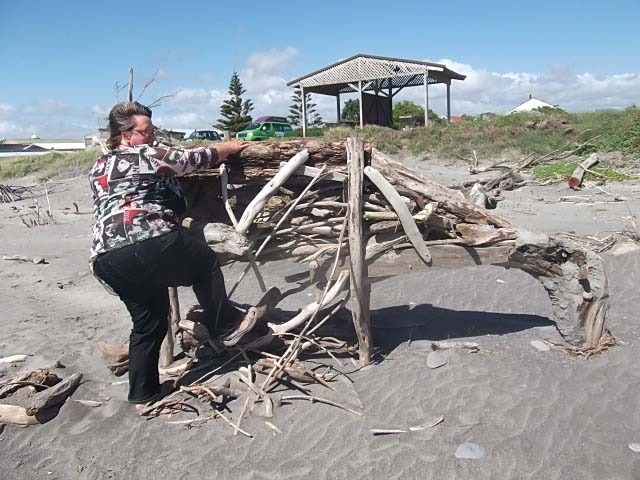 This was Friday 2 March and we had heard the weather forecast was for a weather bomb to hit. 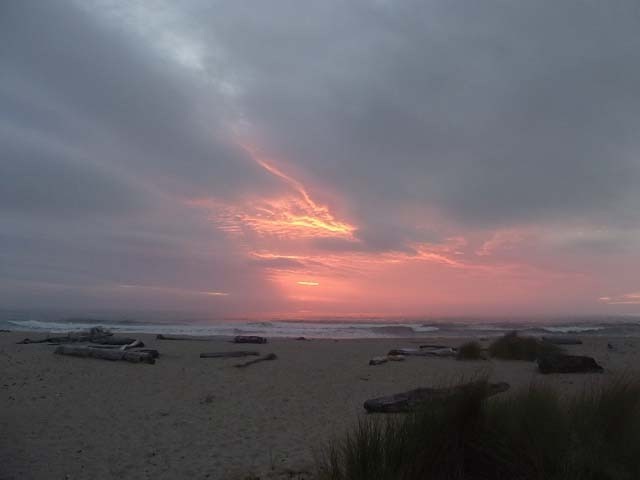 We figured that inland may be a better deal as it was already pretty windy on the coast. 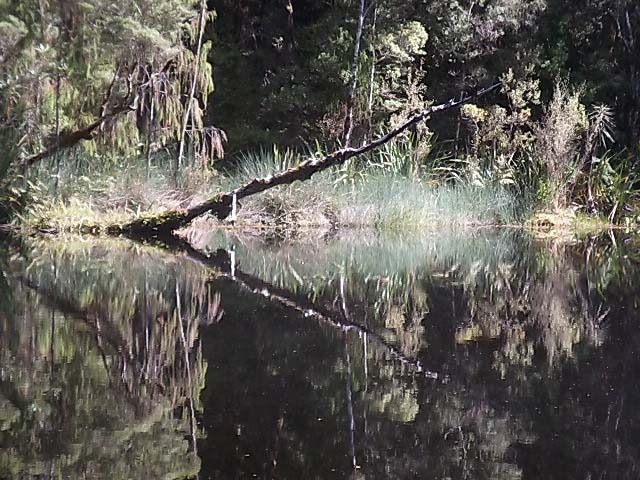 We headed for a DOC camp at Slab Hut Creek, just 8km out of Reefton. 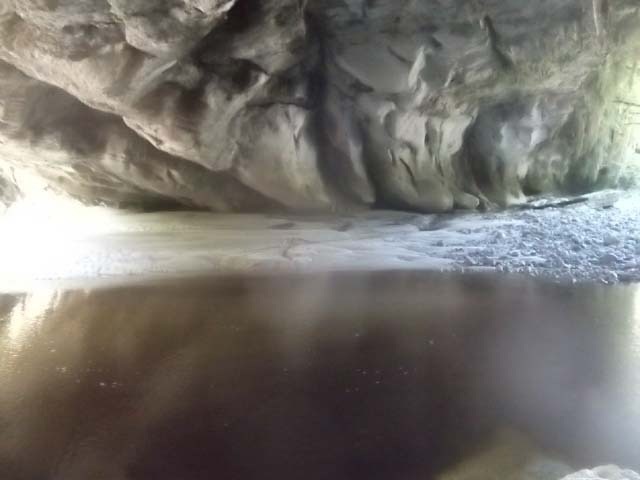 A wonderful spot, with great level gravel parking spots backing onto the creek. The whole area is nicely landscaped and it is all rather pleasant. We waited for the rain and wind to arrive. 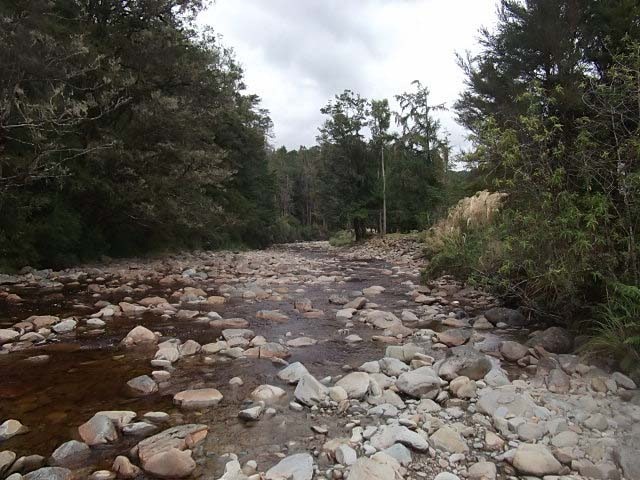 and the creek only 4 metres from the back of the van. 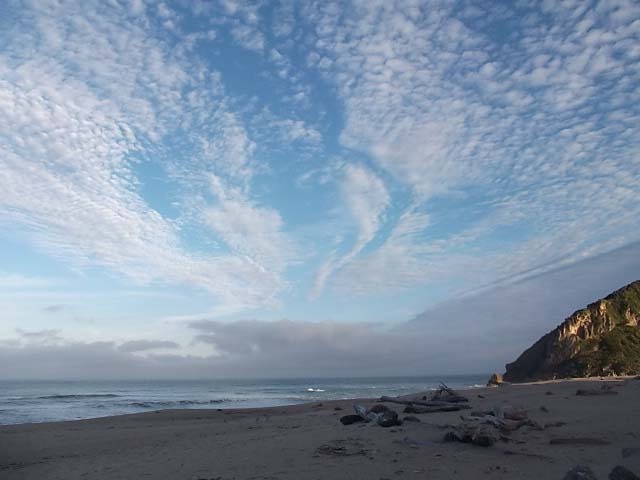 We woke Saturday morning to clearing skies, although rain had fallen through the night, it was not the deluge we were expecting and there was certainly no wind. By mid morning, we had glorious sunshine. This also means the return of the sandflies! 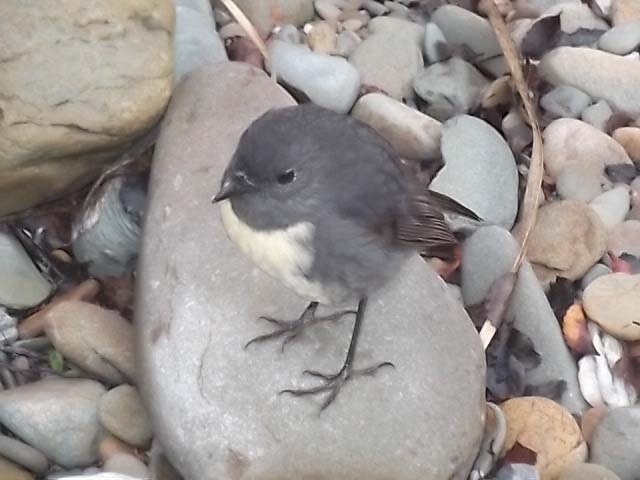 and this wee fellow that follows us everywhere, is not shy and will even stand on your feet. 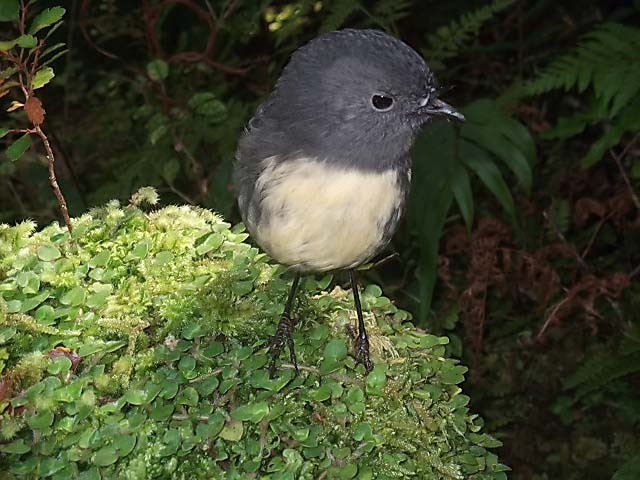 These South Island Robins are very common here and seem to like being around people. 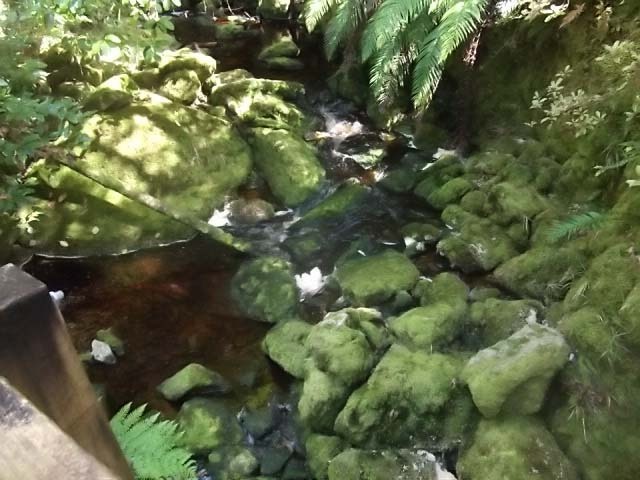 In to Reefton to check out what is there, and to get cell phone reception as there is none at the Creek. Returned to our van finding Pat & Sue just parking up beside us!! 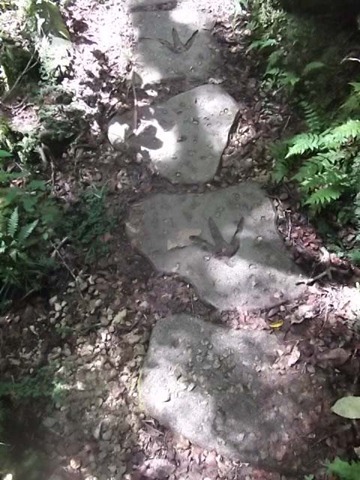 They had been staying just down the road at Nelson Creek, and told us all about the area so guess where we are off to tomorrow to check it all out. 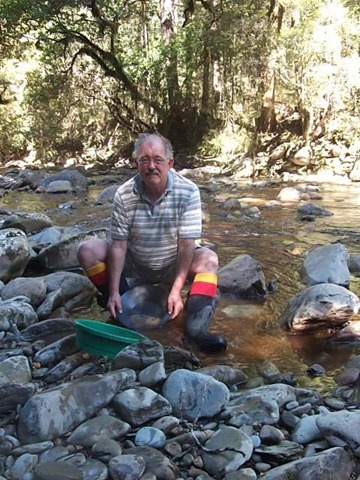 Pat was off up the river to check out the gold prospects. 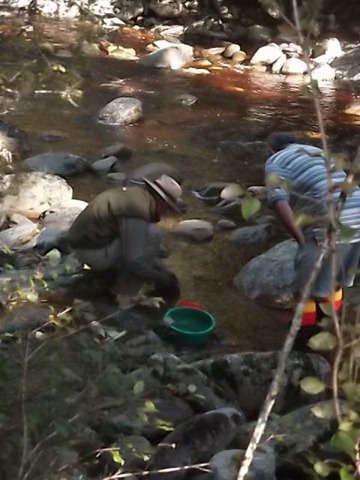 he invited me along and I took the opportunity to try fossicking for gold. This wee fellow was very interested in proceedings particularly when a worm or bug turned up. Of course the usual Happy Hour was taken as the sun set. 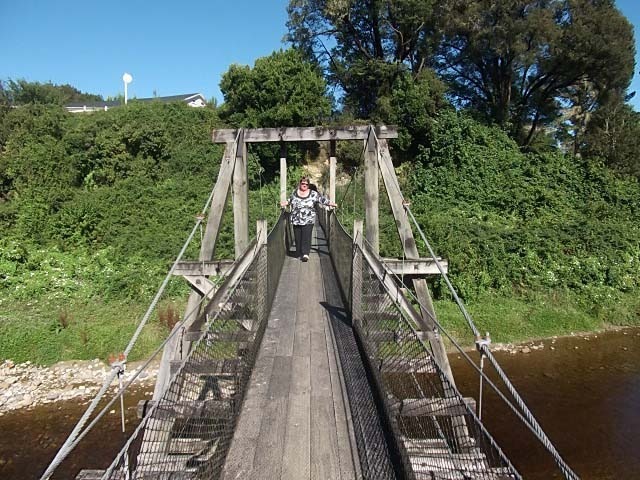 which led to a rather long swing bridge. 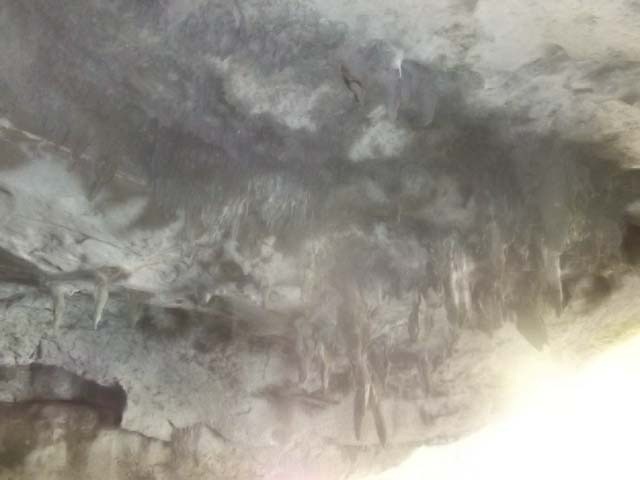 This is a view from about two thirds the way across. 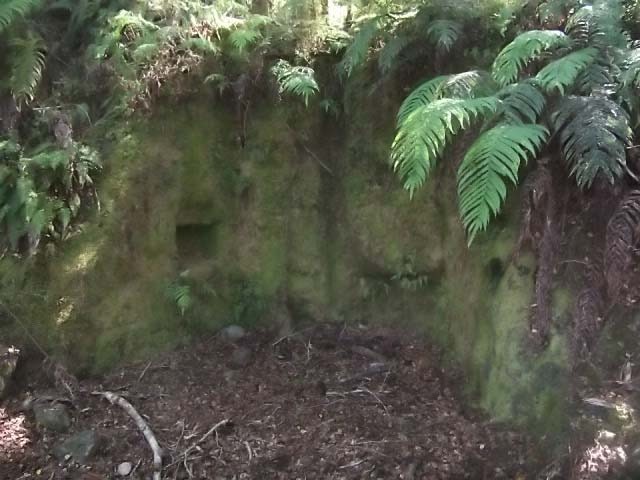 In the bush there was considerable evidence of mining and miners presence. 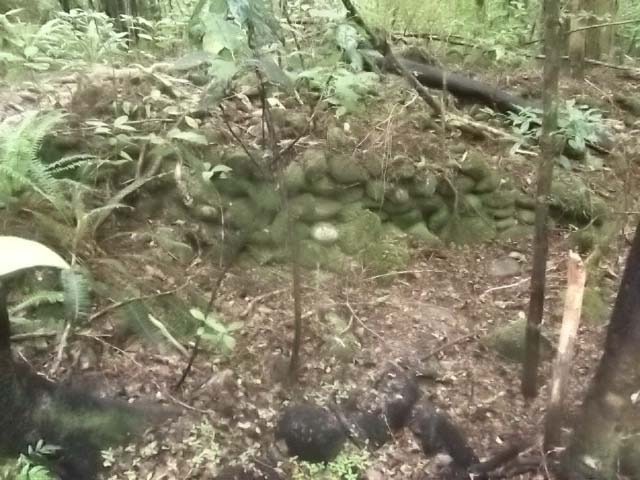 Outlines of the rear of a hut cut into the sandstone. 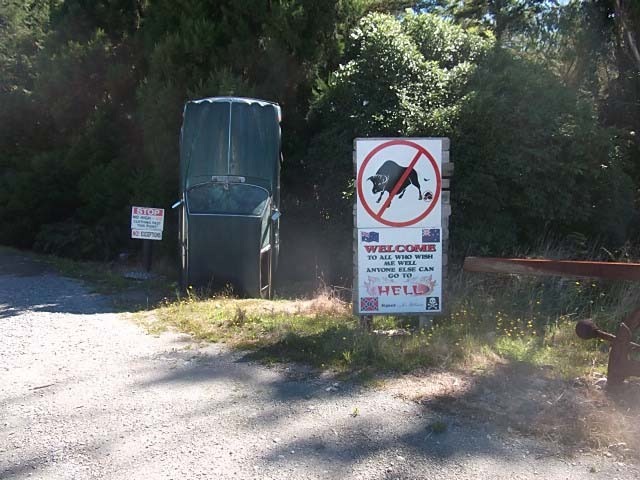 On the way back to the van we came across this most unusual driveway. 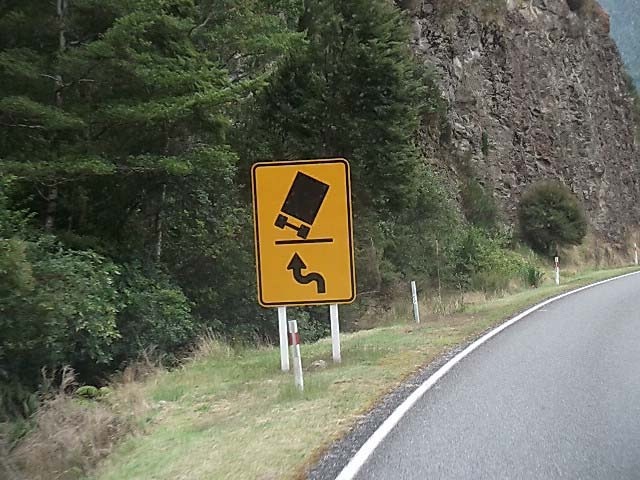 An upturned car on each side with intriguing signs. and yes, he is wearing Waikato sox!! So now the gold bug has bitten, a few flakes are enough to keep one encouraged. Many more games of Sequence played, the girls reign supreme although we did allow the fellows to win occasionally. 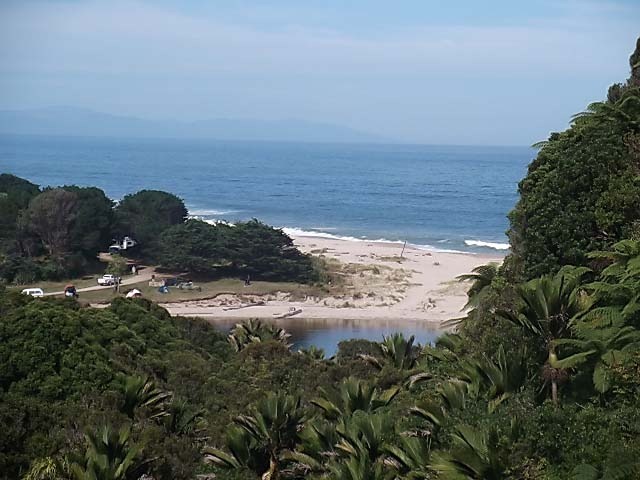 Monday and another lovely day, so we stay around here and will move off Tuesday 6 March toward Westport and Karamea. Due to intermittent internet and phone reception, communication is also sporadic. PS. It is one year ago this week that we purchased the van! And it still has no name. 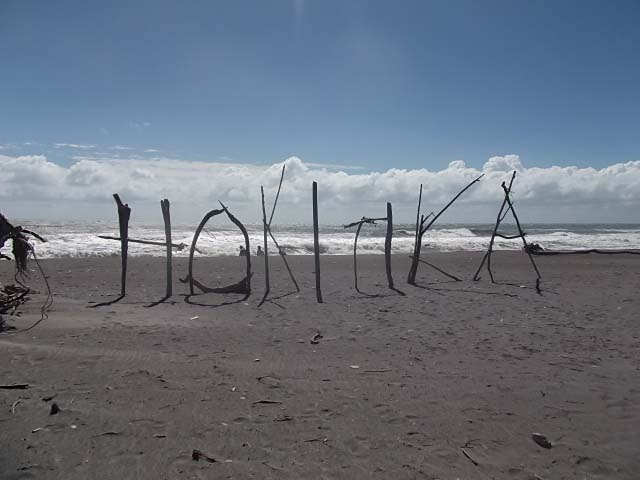 One of the first things we did once we arrived in Hokitika was a visit to the beach to see the iconic driftwood. 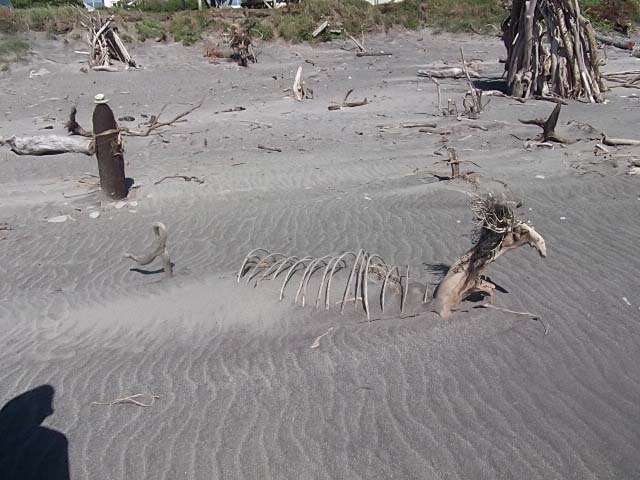 It just so happened that the previous week they had had the annual driftwood sculpture competition on the beach with some of the sculptures still visible. some just relax by the sea. Then, it finally happened! 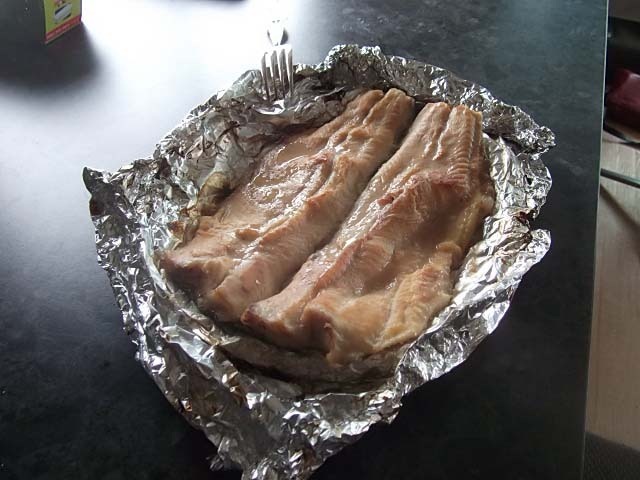 Roy caught a trout, not a bad size and we had it smoked and eating it in a very short period of time and yes, it was damn delicious. 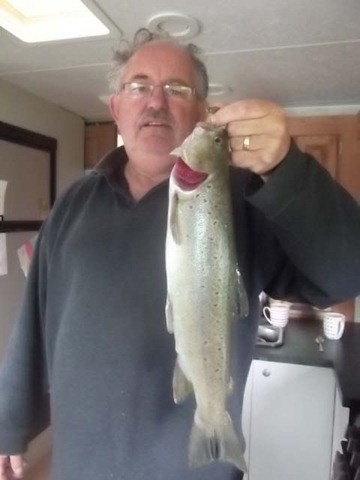 However, the excitement of catching the trout must have been too much as later that evening Roy had a fainting spell…..scaring the bejeezers out of Bernice (as well as Pat & Sue who just happened to be with us sharing some trout). Phone calls to the local Medical Centre, talked to the nurse who then contacted the Dr, oh, did I mention that this was Sunday evening? Anyway, to cut a long story short, it was just one of those things that happens, a sudden drop in blood pressure, but just in case, a check up the next day and all is well. Another one of these “age related” things! 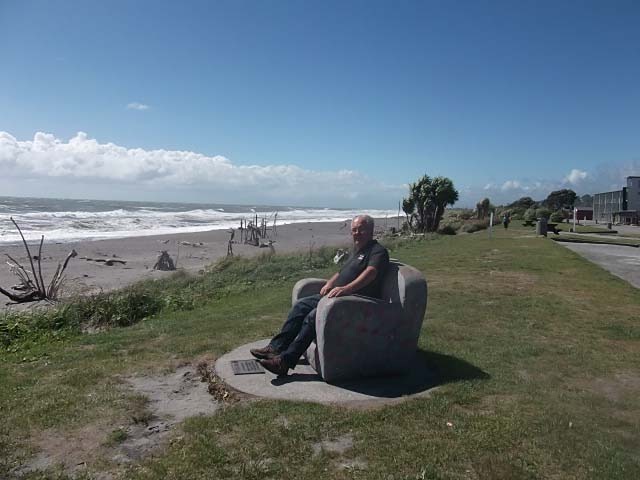 We spent a total of 5 nights at the Hokitika Motorhome Assn Park, over the next few days we went out for a tiki tour of a different part of the Coast. 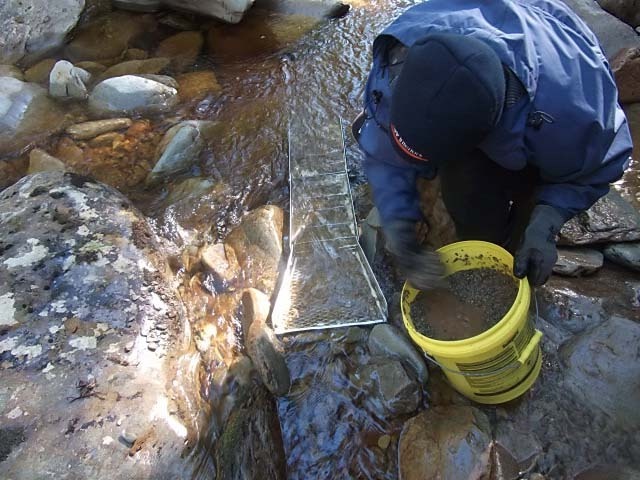 First was a trip to Ross, a gold mining town where we walked around the old mining settlement. 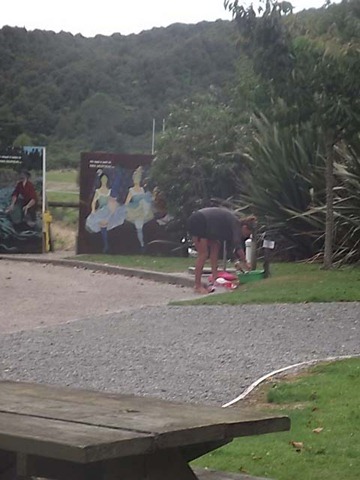 Living and sleeping in a car, then washing your dishes at a campervan dump station. 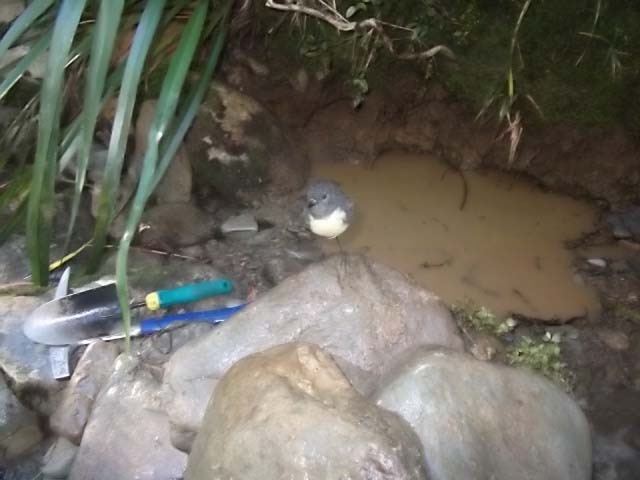 Hmm, wonder if she realised what what just dumped down that drain and then washed out with that hose? Stepping off soap box….. again! 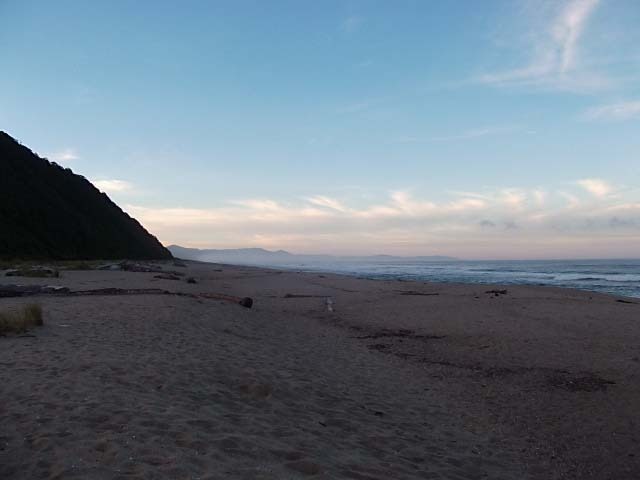 Off from the township was a beautiful, deserted beach. 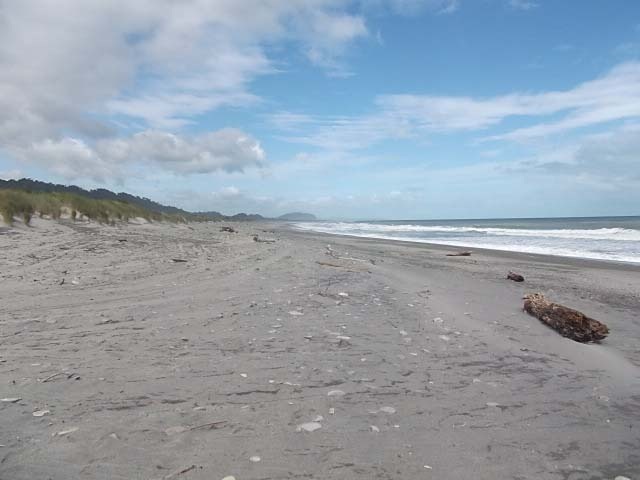 We had hoped that some of the gold from the town mining’s may have washed down to the beach and would be lying around waiting for the Vannini’s to pick it up. Alas, no such luck! Ross Beach House in Ross decorated with number plates and other bits. 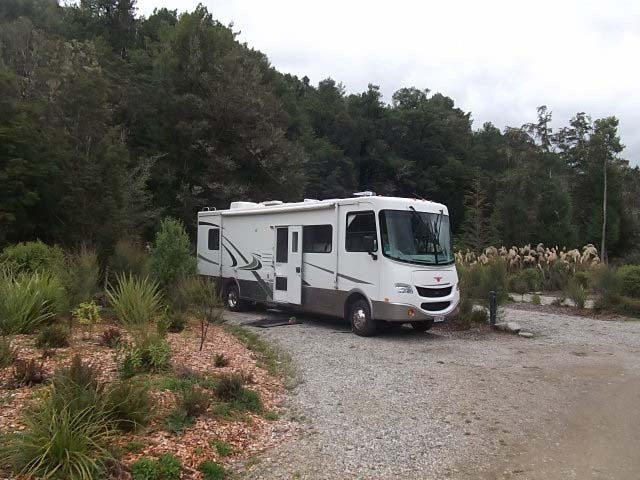 We stopped in Ross to pick up some free range eggs from a roadside stall when another vehicle and 5th wheeler pulled up in front of us, it happened to be Pat & Sue whom we had met in Franz and played cards with. 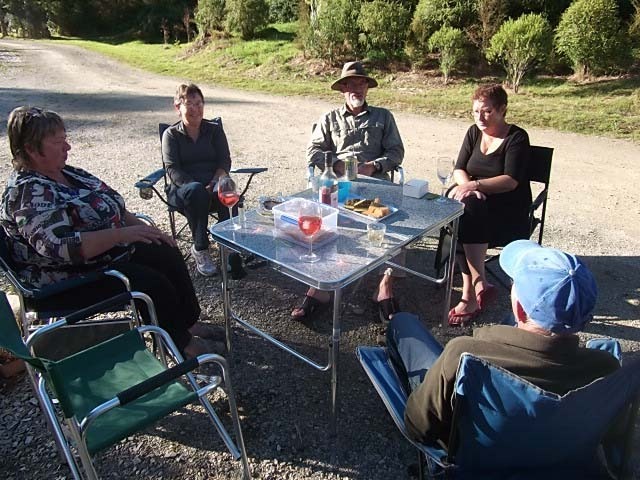 We chatted and caught up on the roadside, Pat & Sue were heading to Hokitika and the POP so we would catch up with them again later. 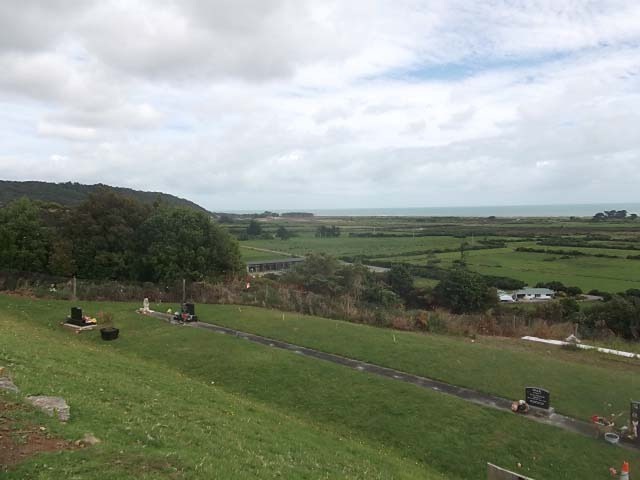 Our next call was to the Ross cemetery which just happened to be on top of a hill affording us great views over Ross, the Coast and the surrounding district. 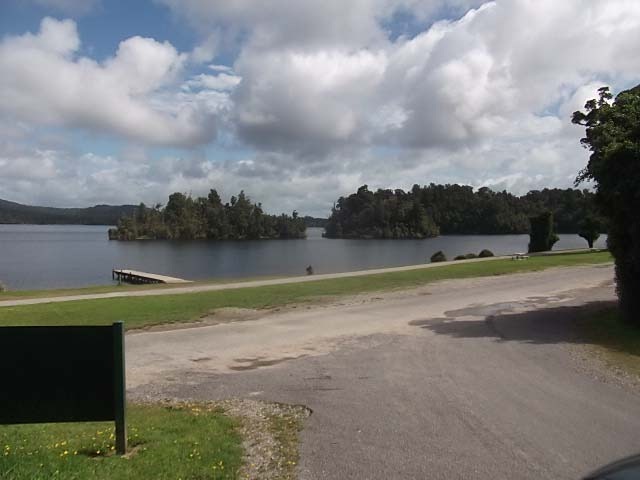 Next stop, Lake Mahinapoua, where there is a DOC camp which we thought may be a good spot to stay at some stage. 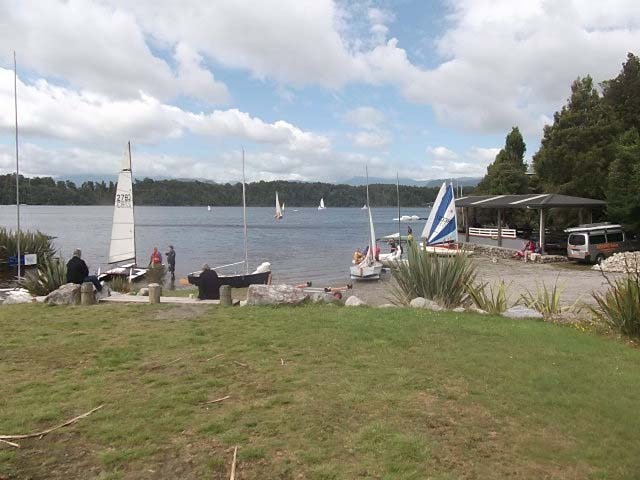 There just so happened to be a yachting regatta on over the weekend so the place was quite busy. We got chatting to three women who were sitting watching the yachting. It turns out that they had grandchildren sailing, and they all were staying at the camp in their campervans. 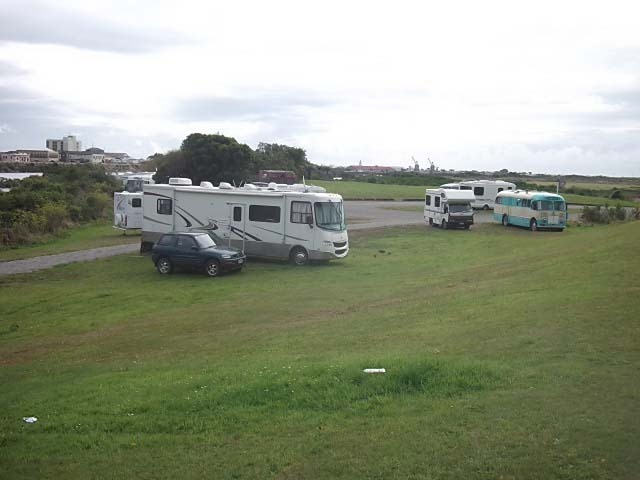 We have met a number of single women (men as well but not in the same numbers) who are travelling around the country in their motorhomes having a great time. Ages range from 40’s through to well into their 80’s, it is really nice to see them out and about enjoying life. 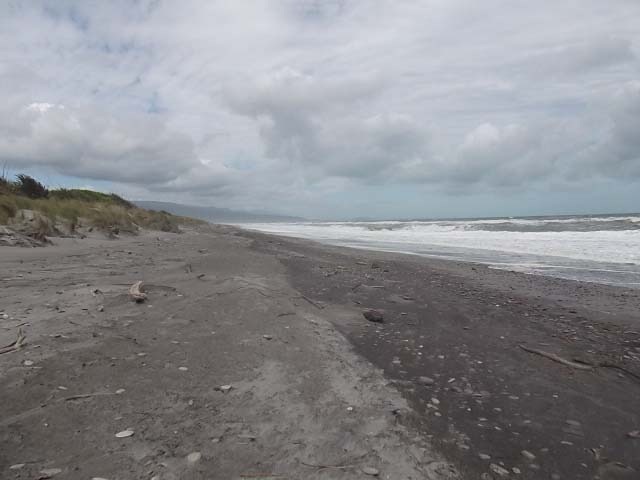 Next stop was Manunui Beach, accessed through a short bush walk. 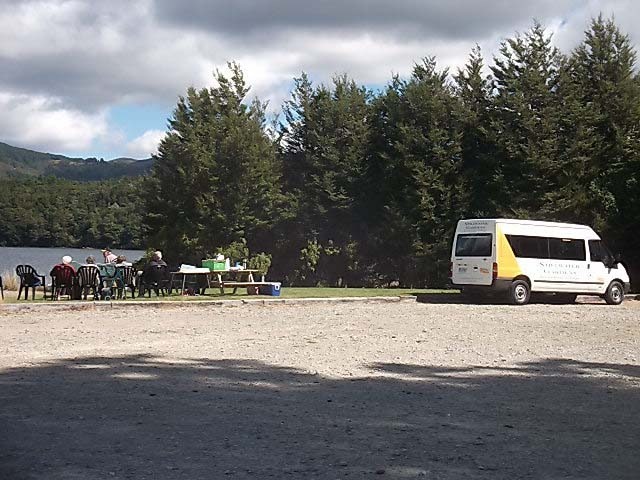 Another day and another trip, this time to Lake Kaniere, and another DOC camp. 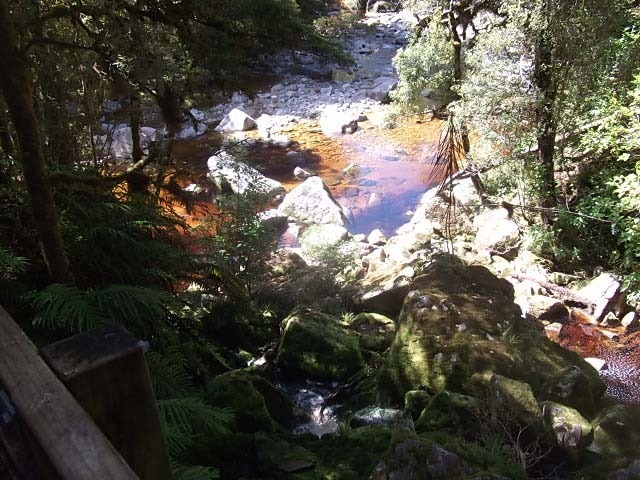 Tannin coloured water, a very common sight on the West Coast. 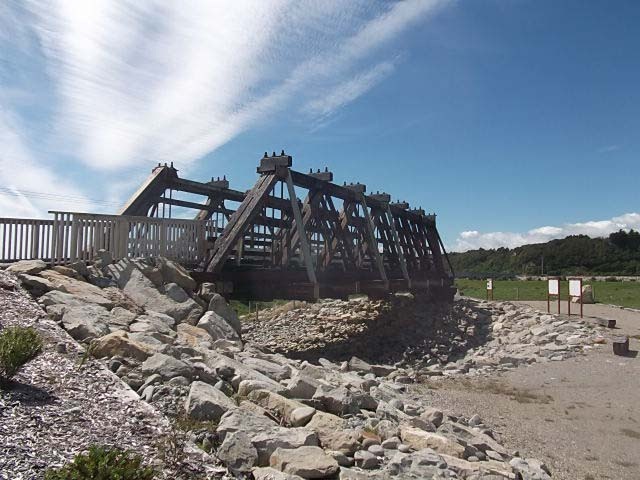 This is part of the old road/rail bridge across the Arahura river. 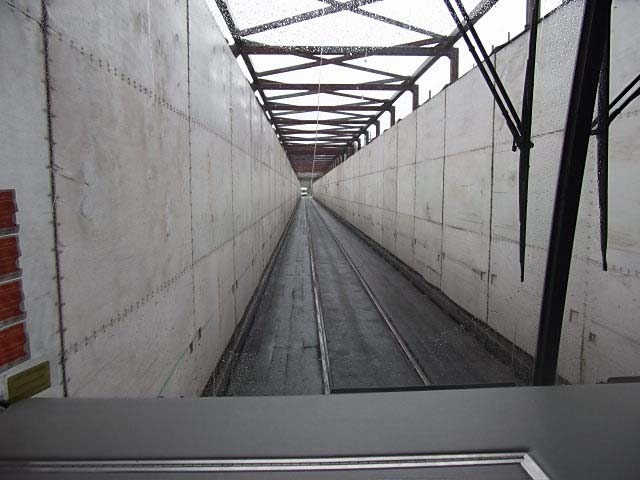 It has been preserved and mounted alongside the new bridge with a very informative set of information panels. 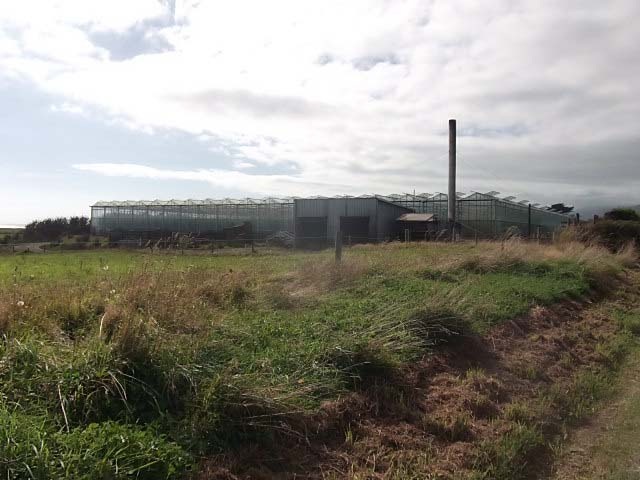 Arrived at Goldsborough to find … nothing. Not a sign of the original town and buildings is to be seen. But there was a very good DOC camp alongside the stream. And Wekas taking an interest in the visiting population. 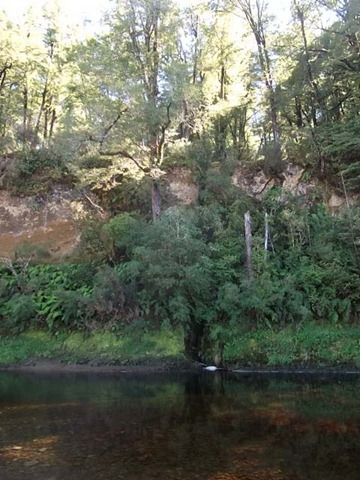 The stream is designated as a Gold fossicking site. 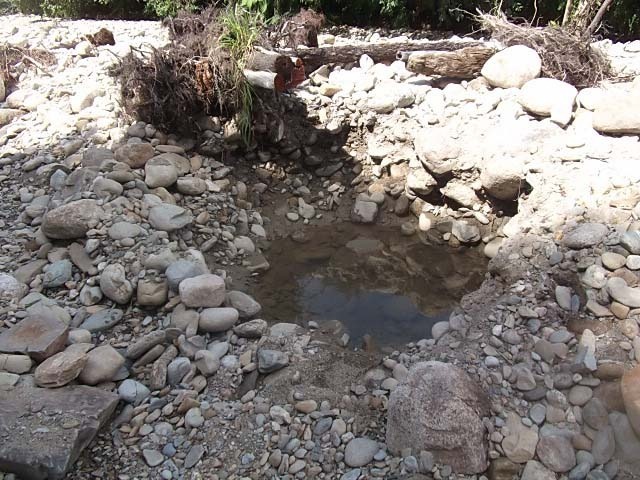 As a result there are a number of holes in the riverbed where people have been trying their luck at prospecting. 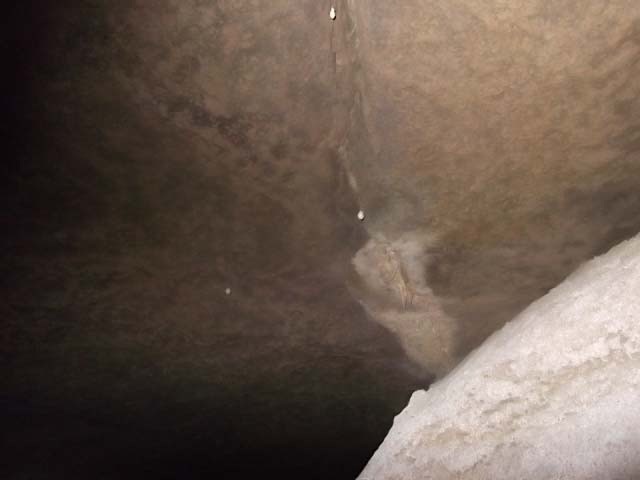 Typical hole in the riverbed. As an aside we shall have to return to this area and stay at the DOC camps as they are in great locations and off the main roads. 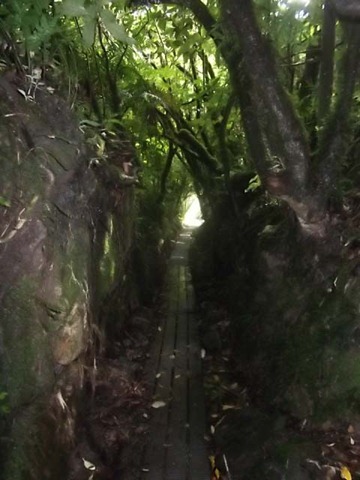 On the way back from Goldsborough came across an interesting short walk through the bush along a track that passed through a number of tunnels that had been created to get water to sluicing sites. 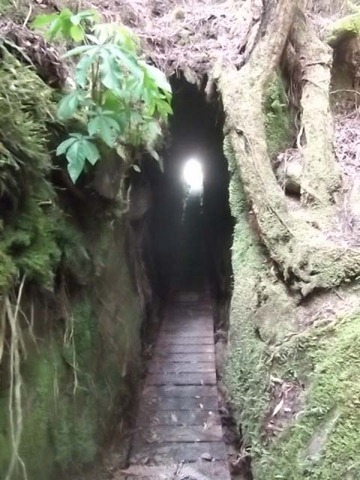 First tunnel immediately on the side of the road. 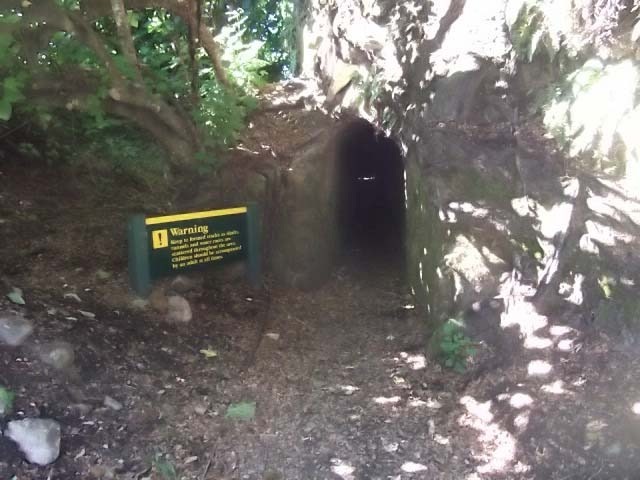 Very narrow with signs of the original pick marks still remaining on the sides of the tunnel. 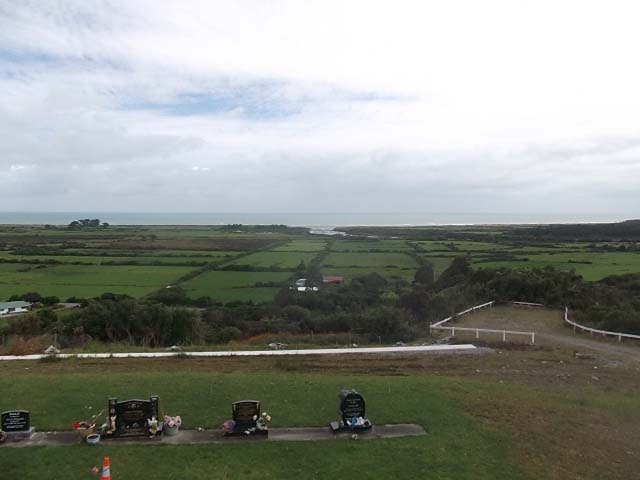 On the way home found a sign on the side of the main road pointing to Seaview so decided to have a look and hope to get a high view of Hokitika and surrounds. Instead of finding a viewpoint we found the site of a major Mental Hospital (closed). 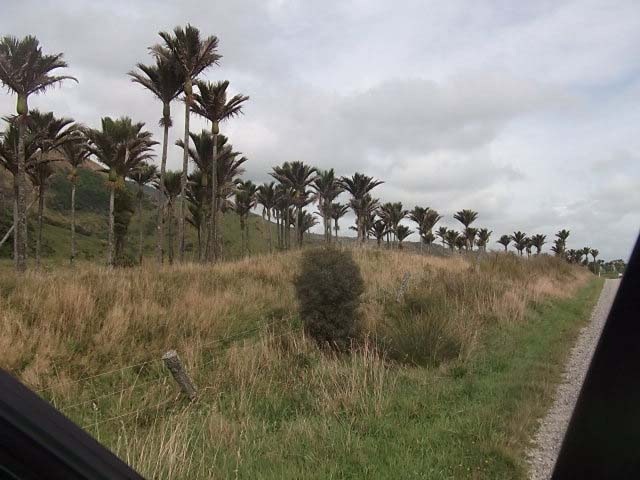 It covered 61 ha (150 acres), much larger than Cherry Farm north of Dunedin. In 1955, Seaview peaked with 549 patients. 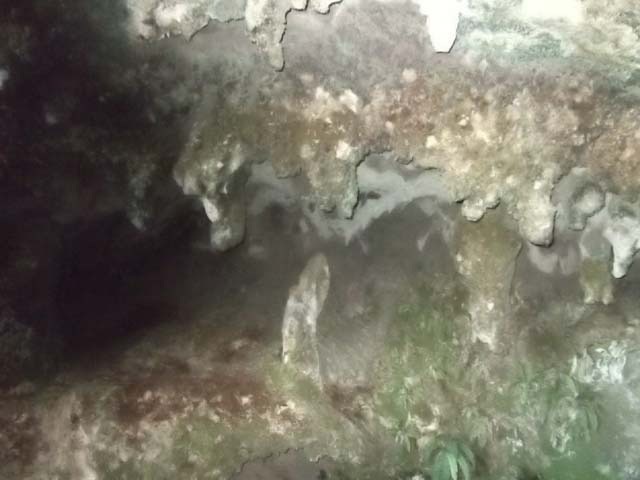 By 1996, there were 100, and when the facility closed in 2009, it was down to 22. It must have been fairly well self sufficient as it looked like there were remains of power generation plants, gardens, hospital and school rooms. 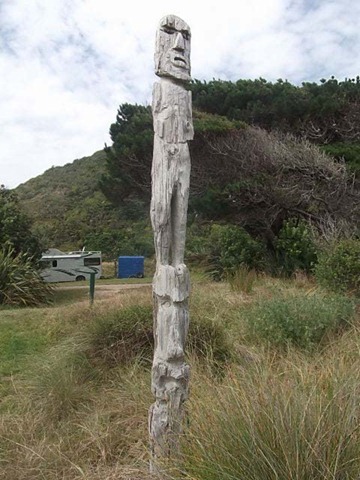 Also, surprisingly, there was a memorial to Maori who had been transported from their home regions in the North Island, from the far North through Central North Island and especially from Taranaki. 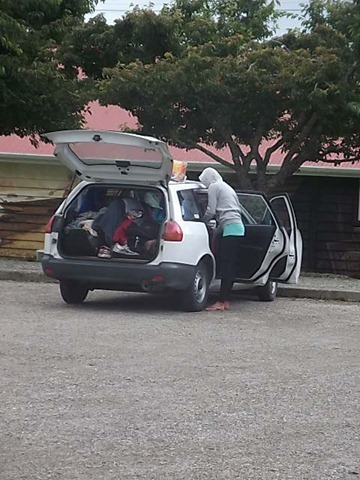 These people were forcibly removed and transported to Hokitika as were some to Dunedin. All through the week, we have returned to the park and our van, Pat & Sue parked up next to us, so many enjoyable evenings were spent playing Sequence and talking. 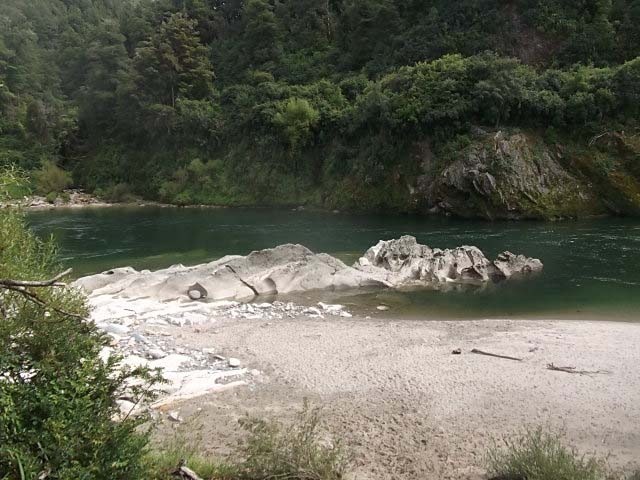 We all left the POP on Wednesday 29th February with us heading for Greymouth.